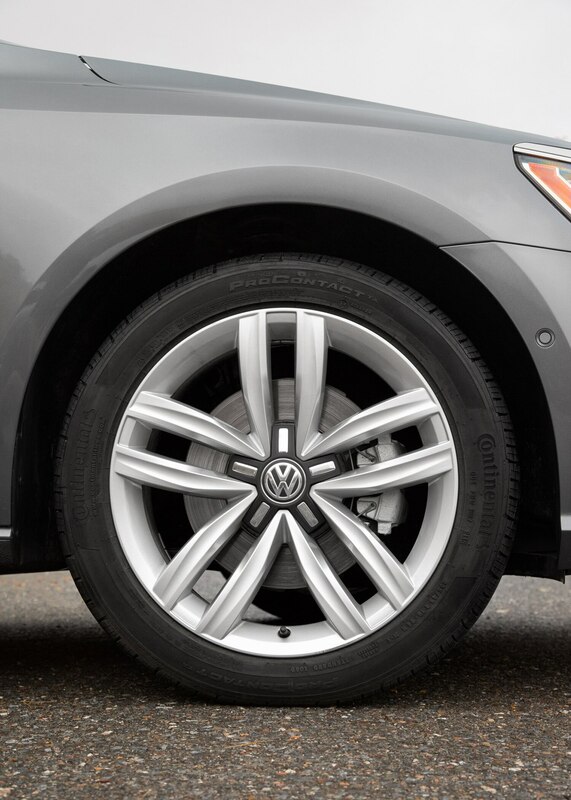 Fresh tech and tighter styling come at a bad time. 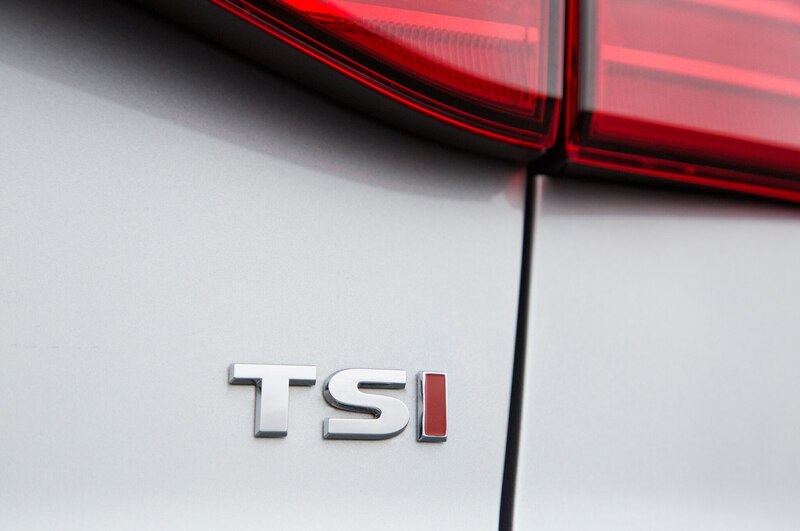 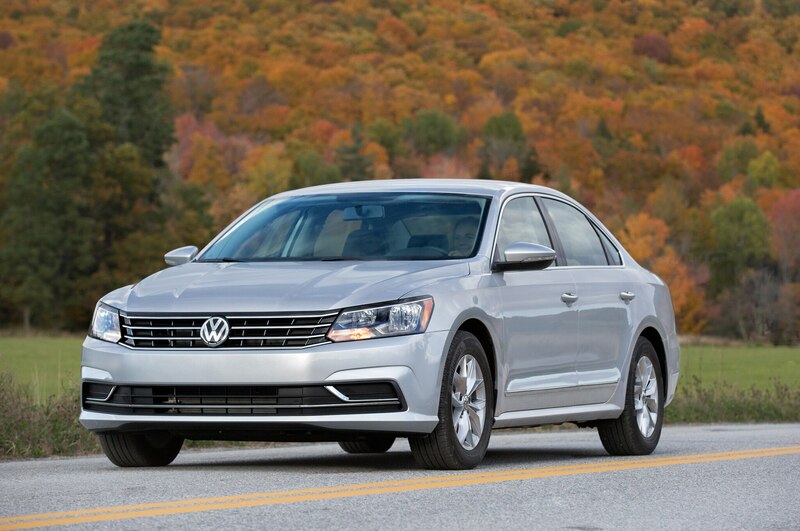 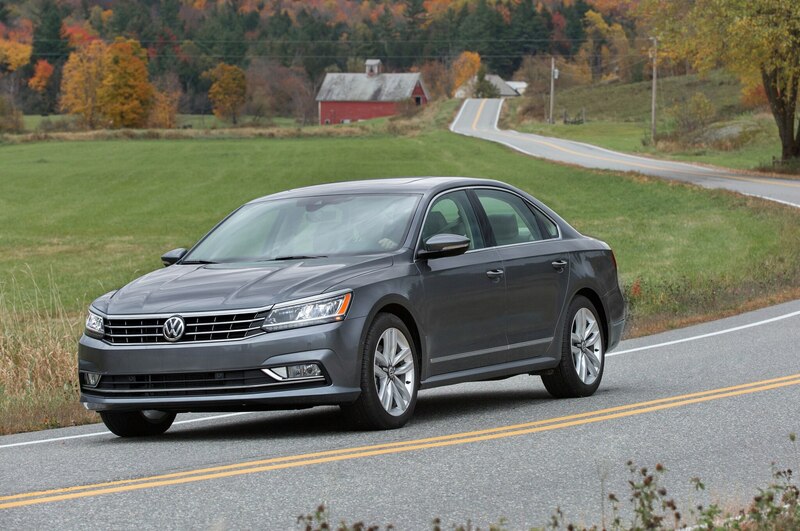 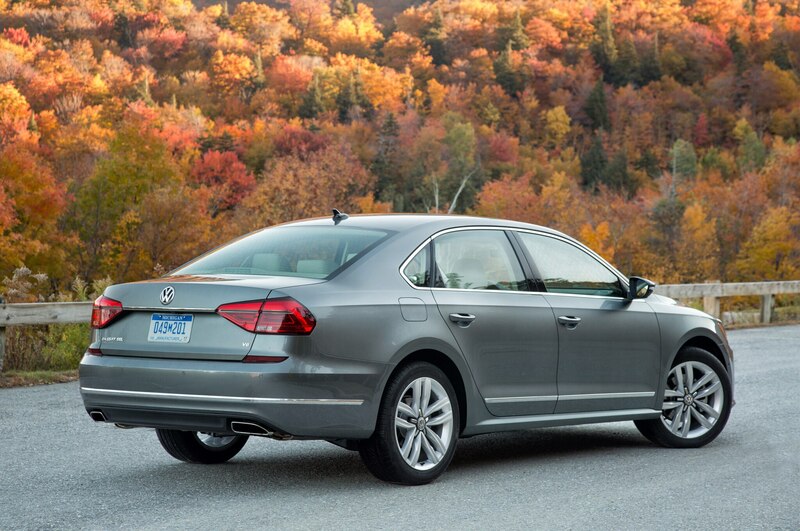 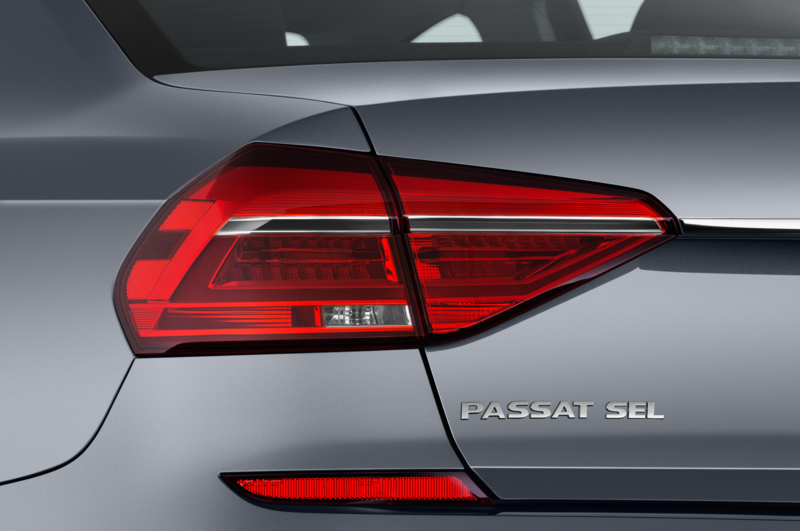 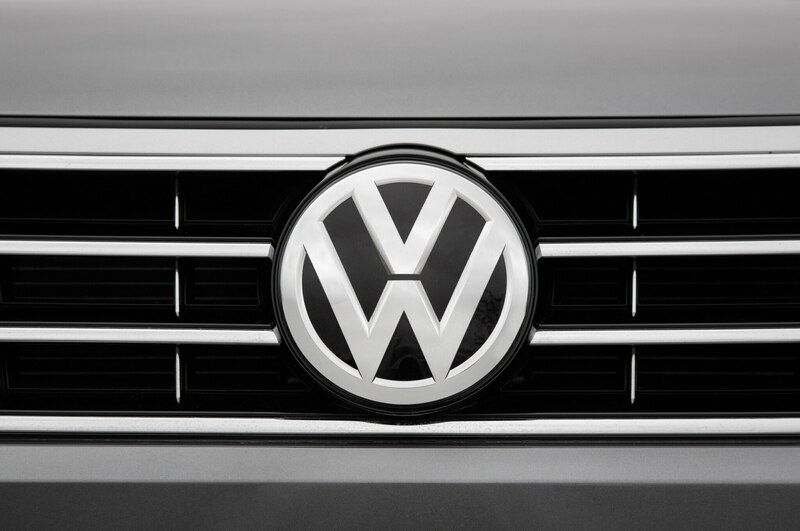 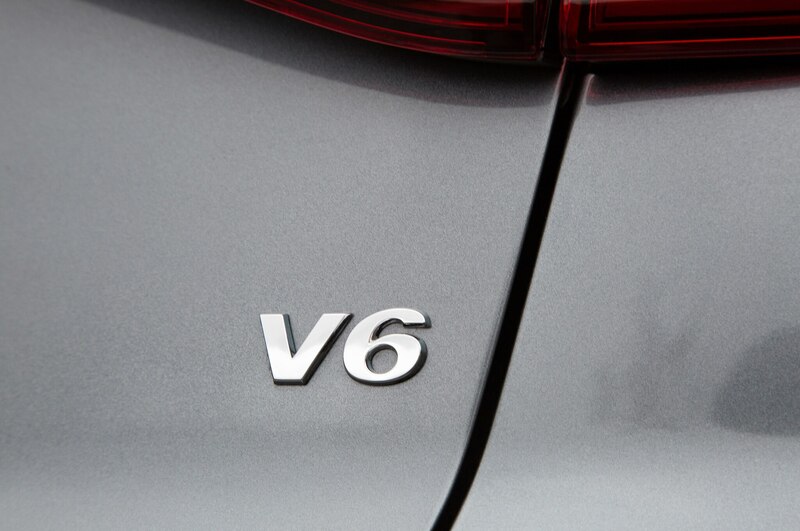 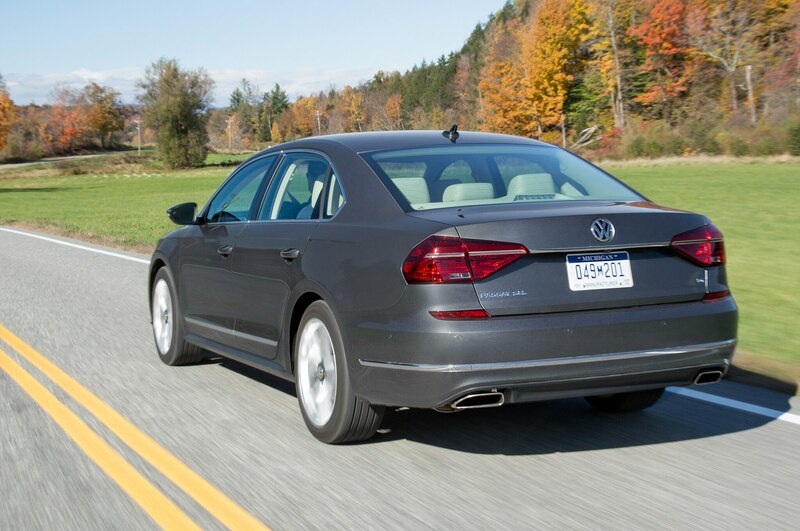 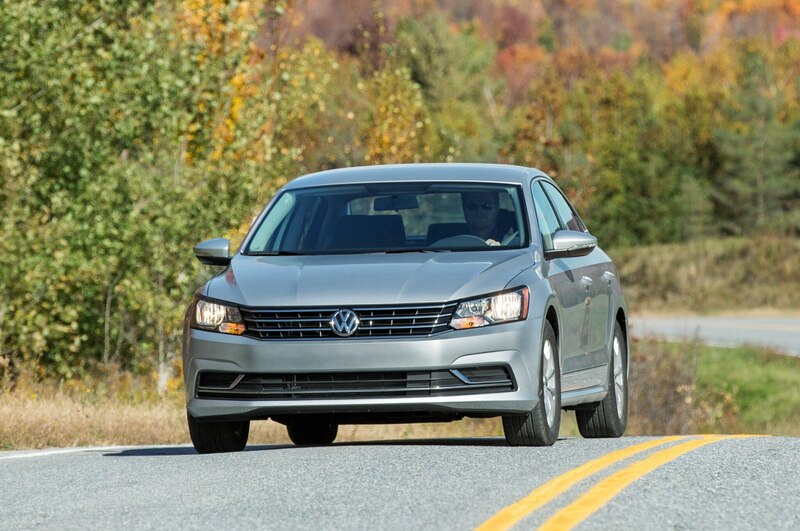 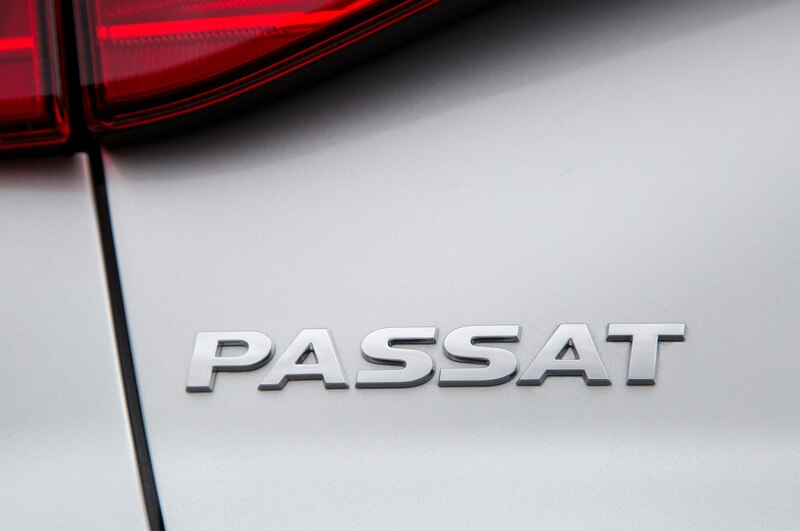 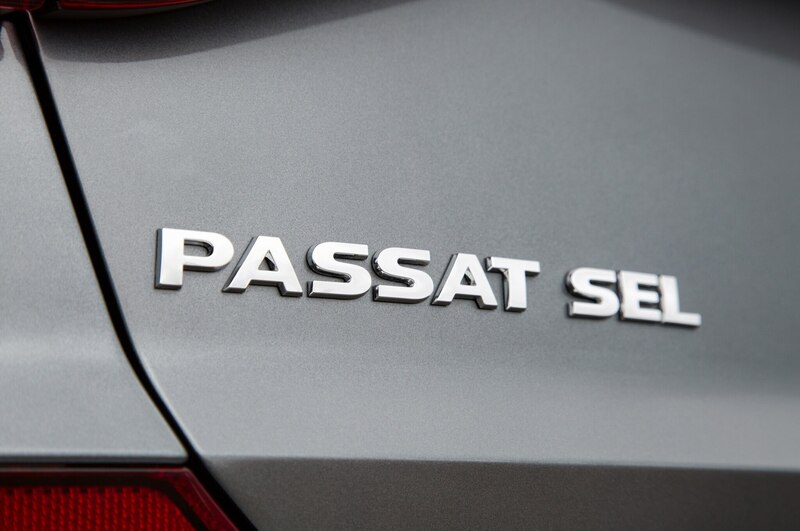 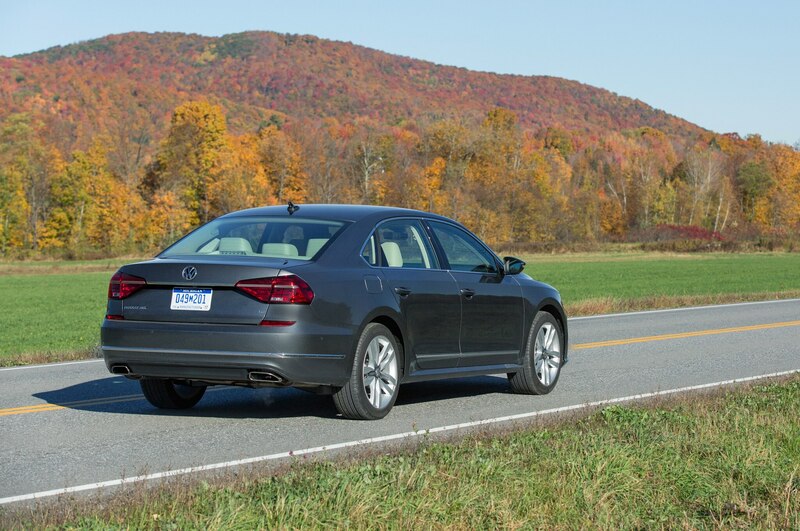 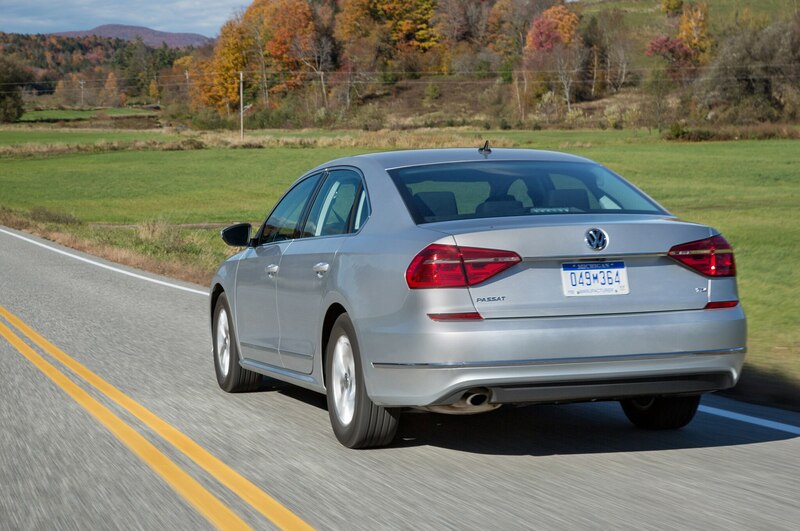 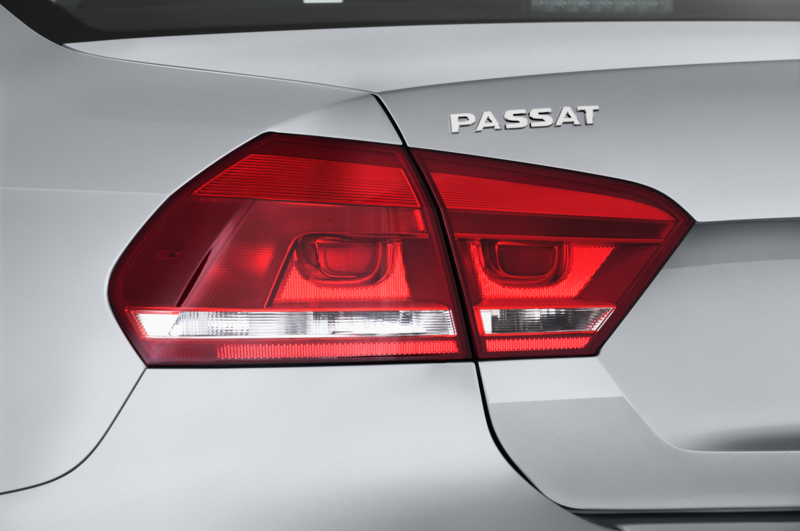 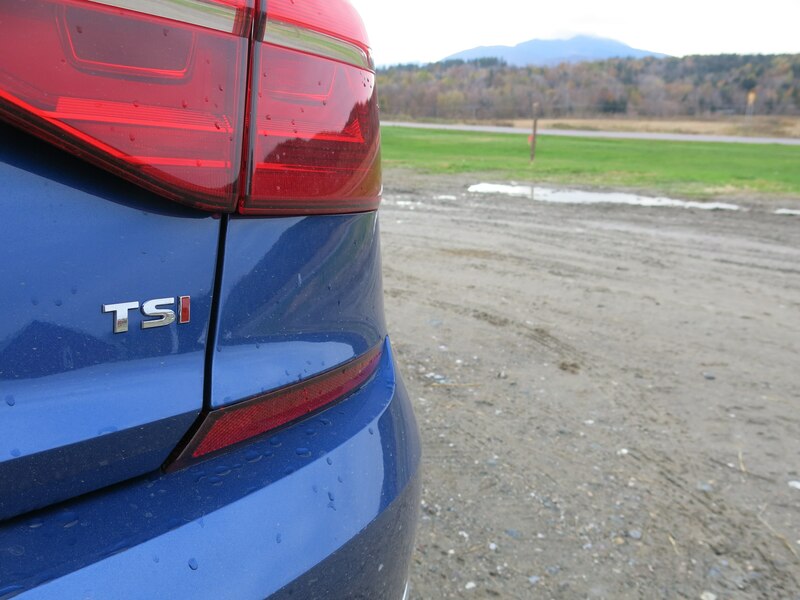 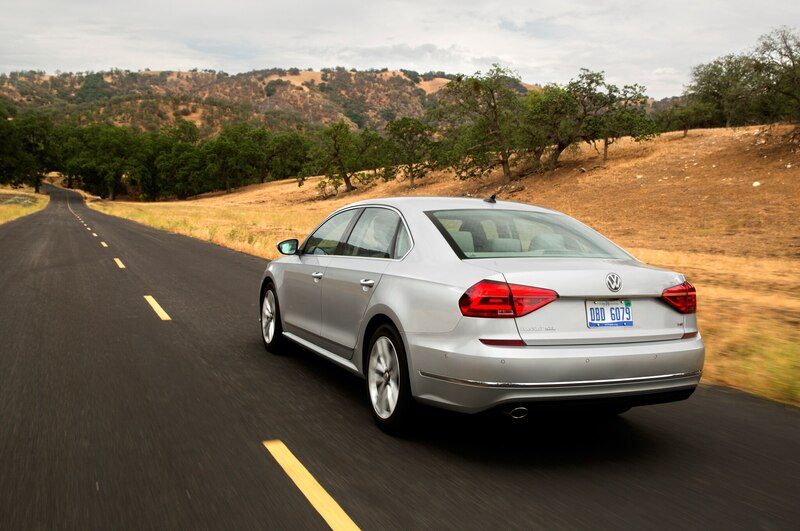 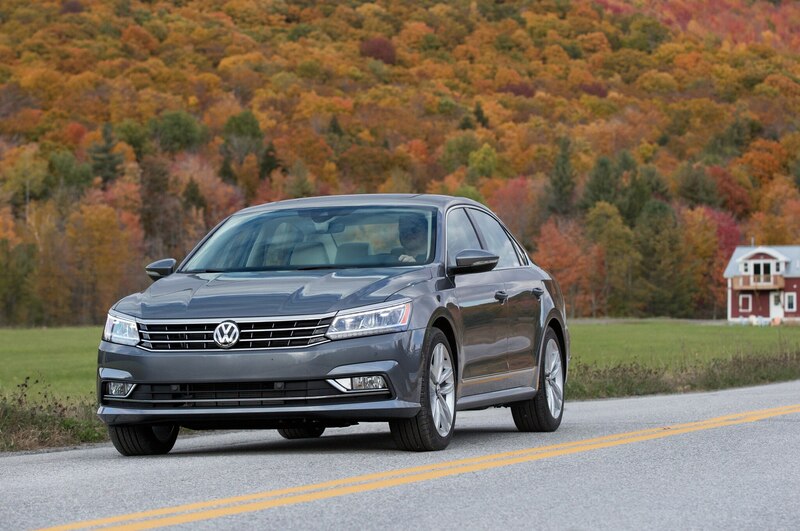 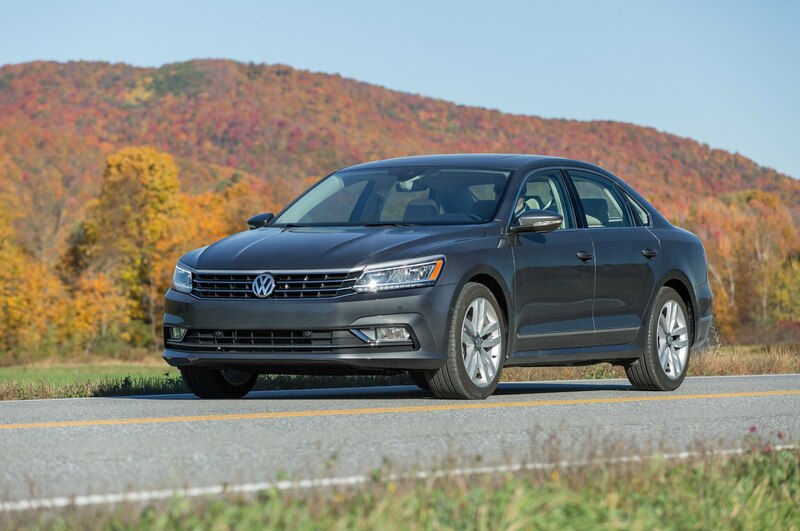 Let’s get this out of the way: There isn’t a TDI version of the 2016 Volkswagen Passat. 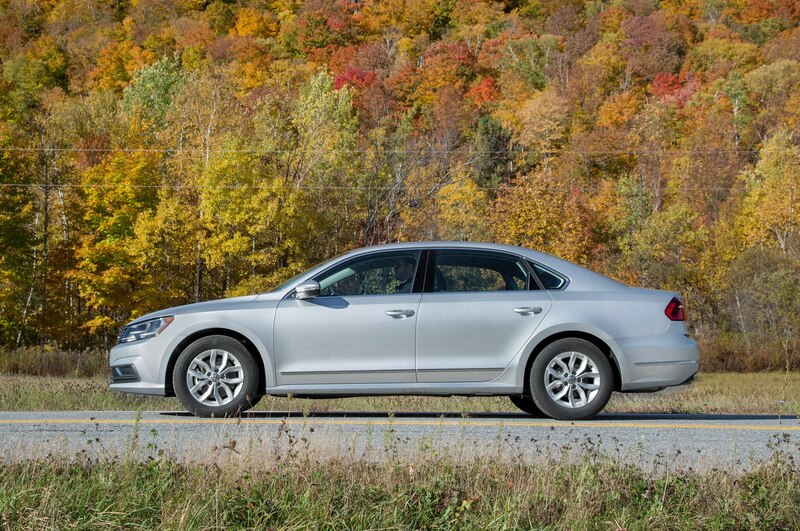 VW has pulled diesel certification for the latest Passat until it can find a way to get back in the EPA’s good graces. 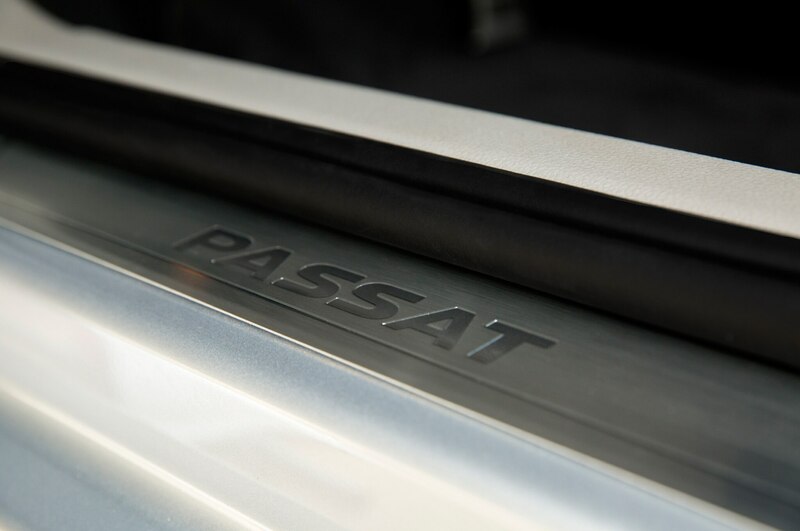 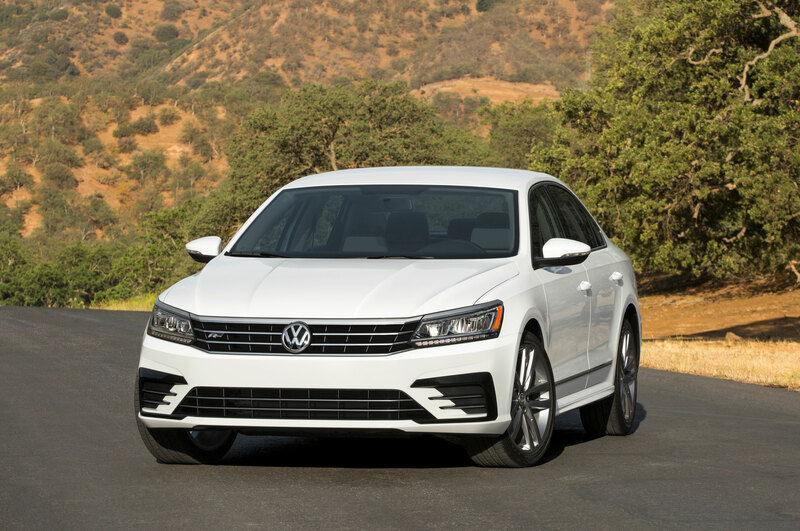 But the scandal-plagued automaker still has new cars to sell, so it’s launching a refreshed version of its midsize Passat. 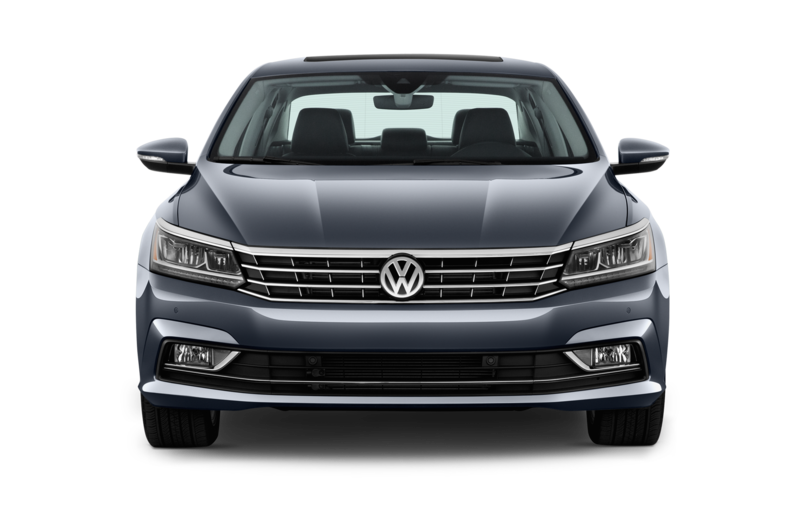 Volkswagen hasn’t rethought the 2016 Volkswagen Passat as much as it has modernized aging elements of an otherwise-great mainstream car. 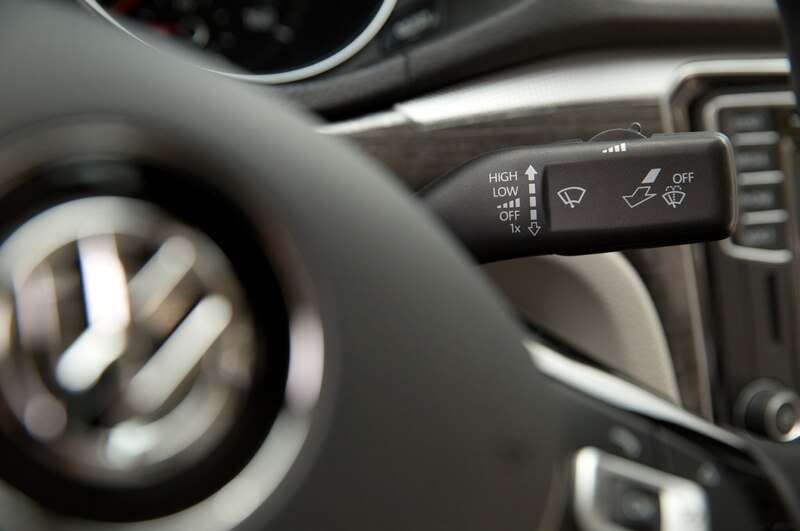 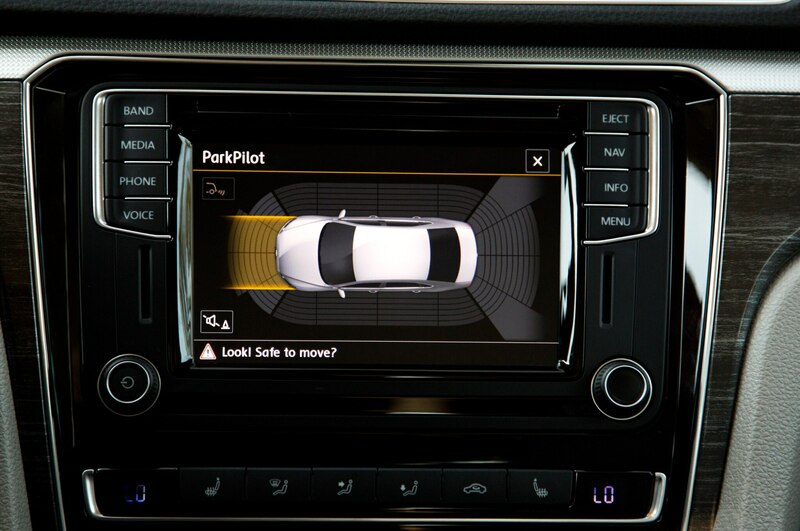 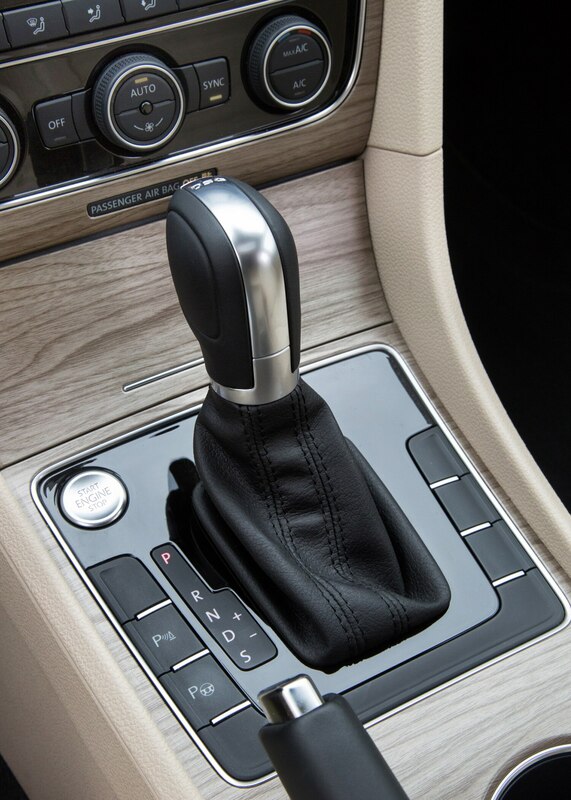 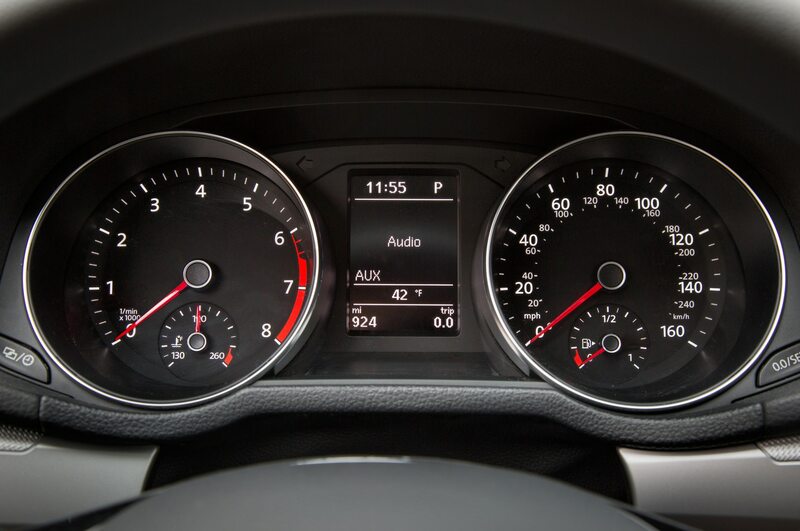 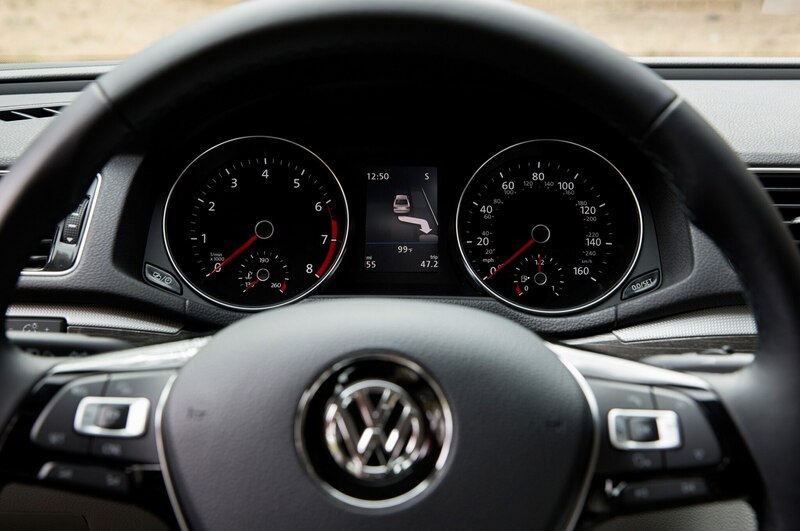 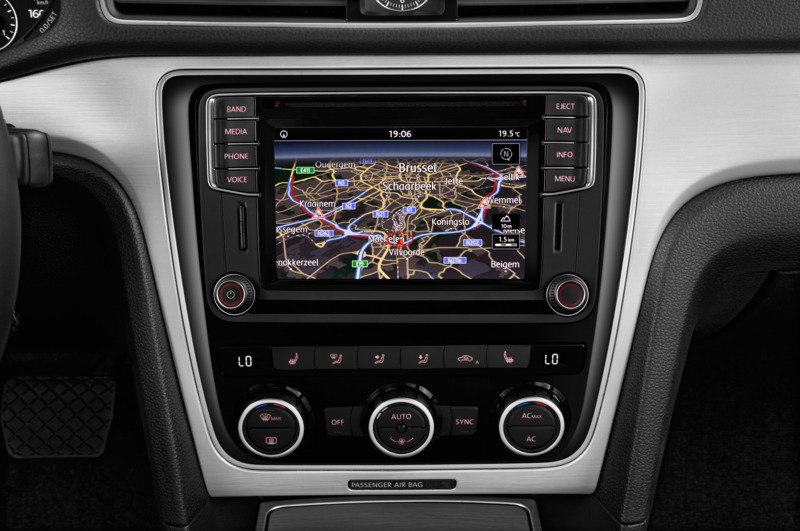 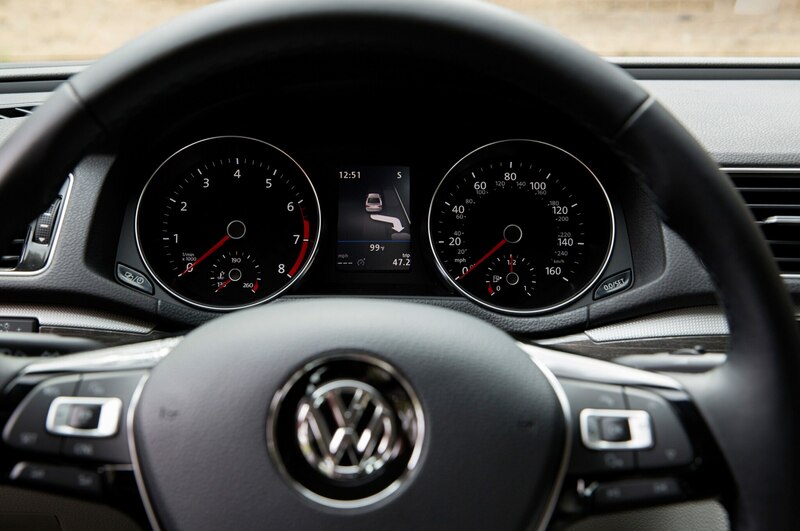 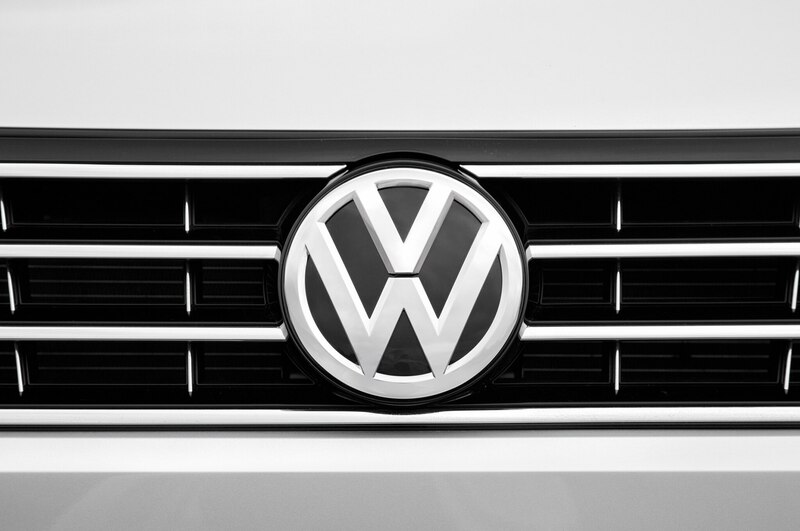 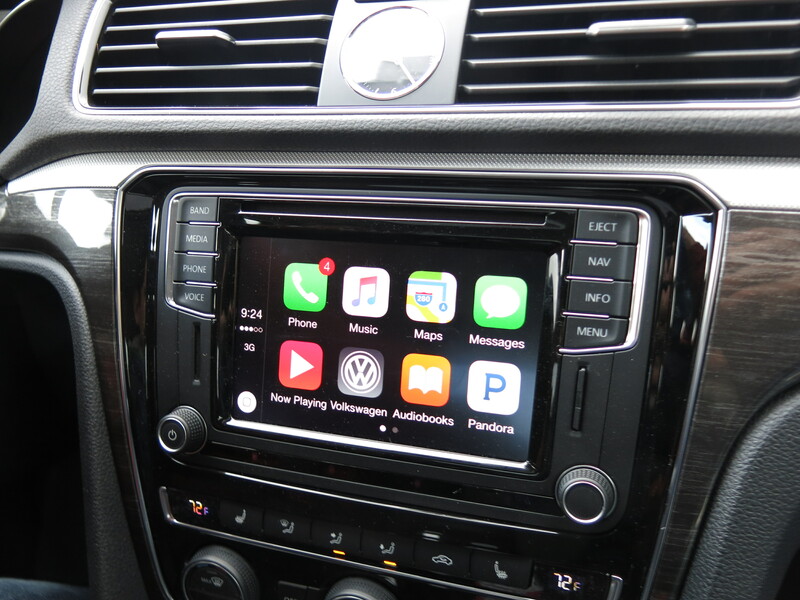 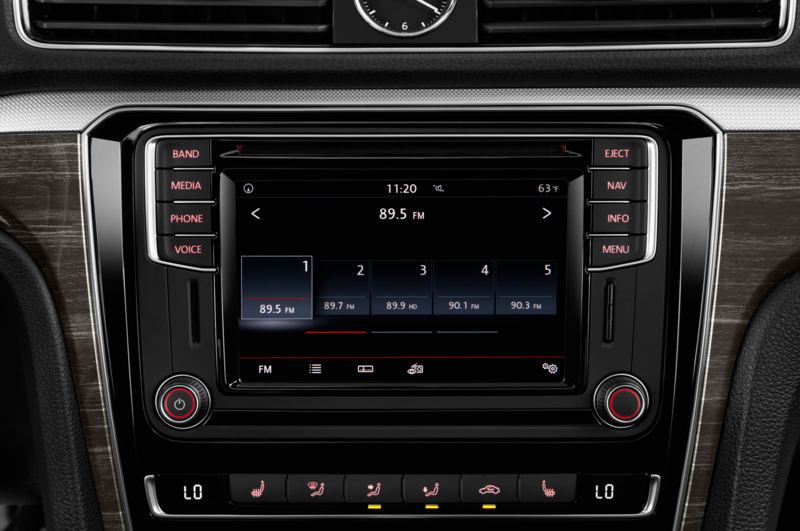 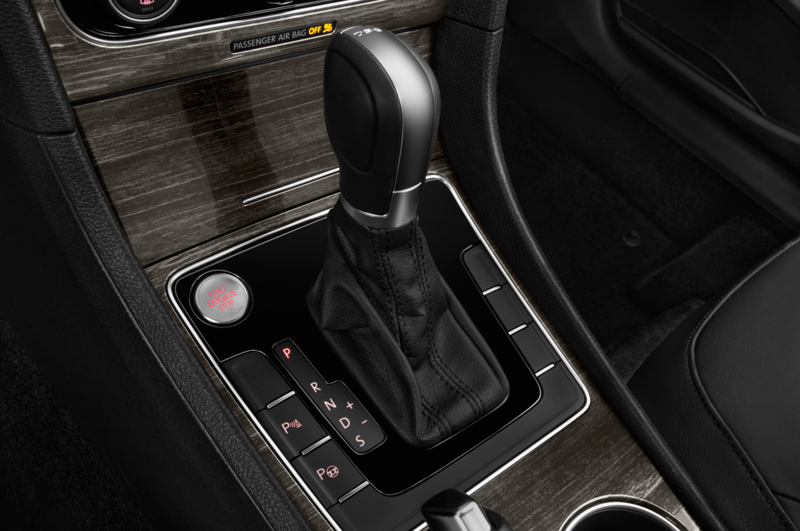 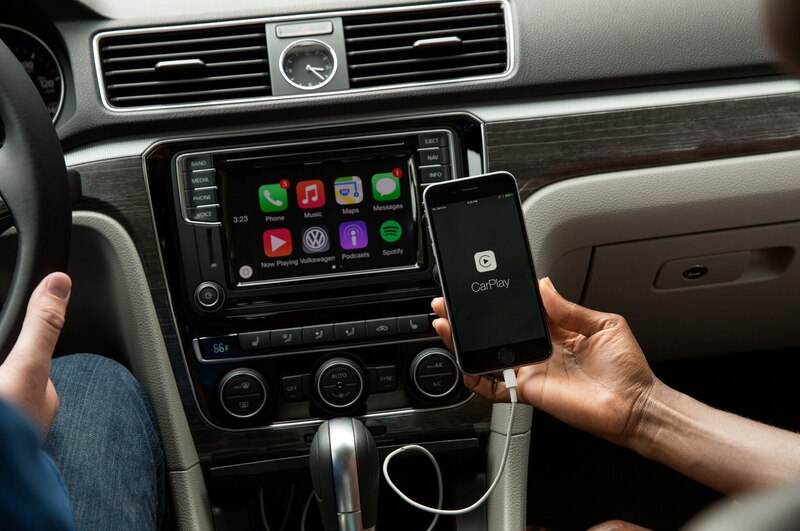 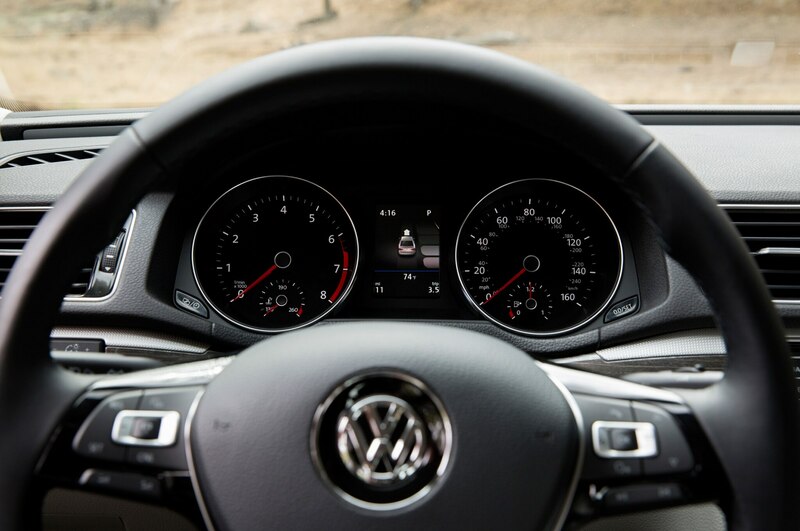 Volkswagen has updated the Passat’s once-lagging safety and infotainment technology with the latest and greatest from Wolfsburg, including Apple CarPlay and Android Auto (bundled in VW’s App-Connect software), and a new MIB II infotainment system. 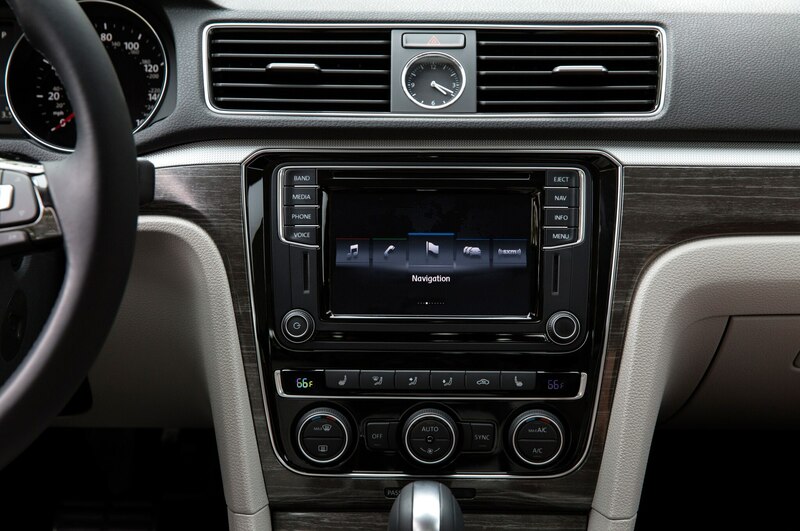 MIB II isn’t as easy to use as Mazda’s infotainment system, and it lacks the visual pop of Fiat Chrysler’s Uconnect or Hyundai’s Blue Link, but none of that really matters because of MIB II’s phone-mirroring capabilities. 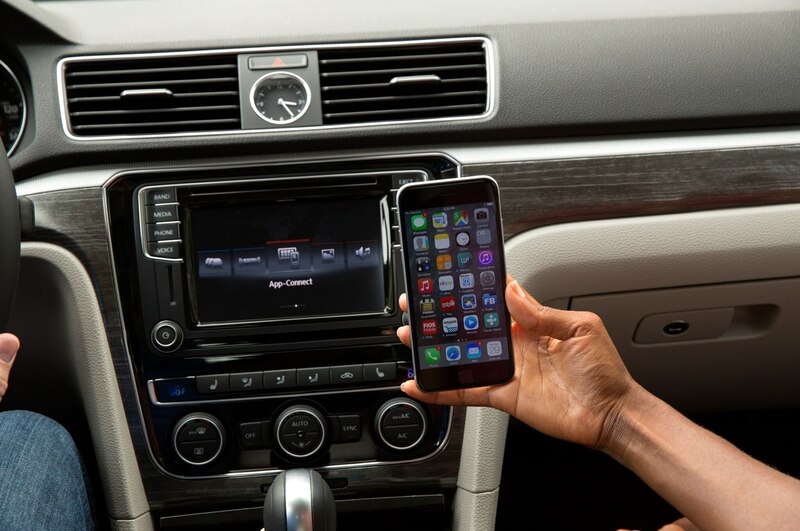 Most people will do what we did: Plug in their smartphone and never venture from the familiar, attractive Apple or Android screens. 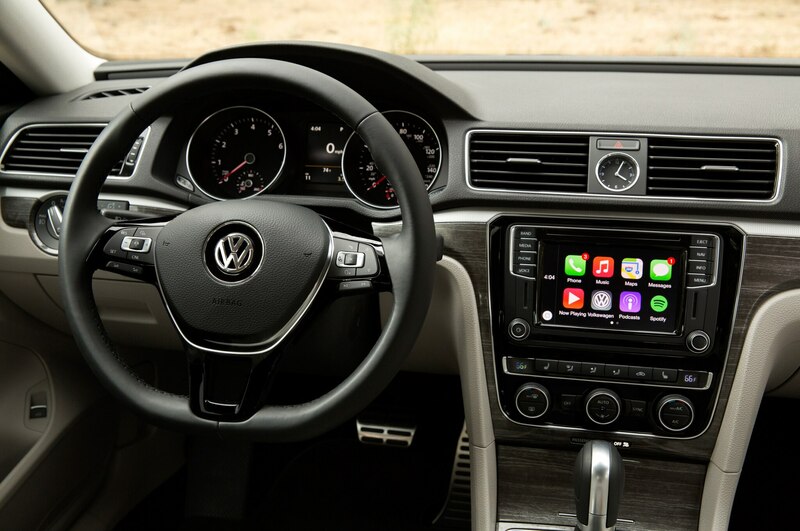 The systems are still a bit limited as far as available apps and messaging convenience are concerned, but it’s a huge improvement over the outgoing Passat and a big step forward in VW’s approach toward car connectivity. 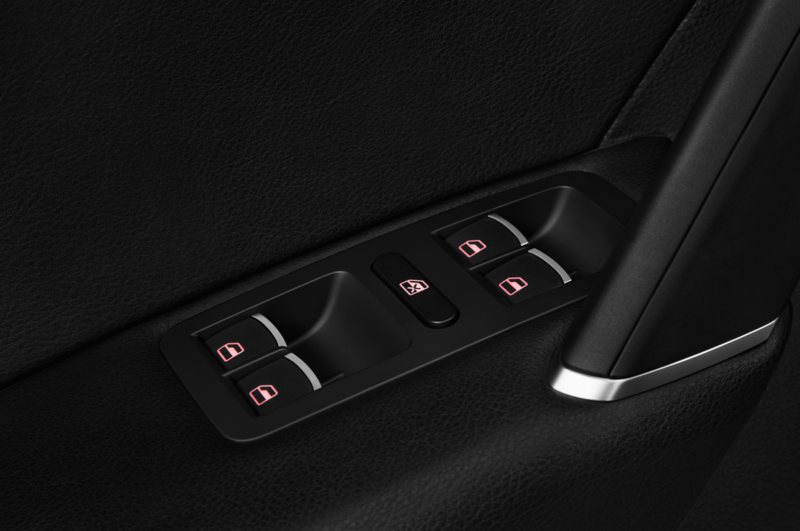 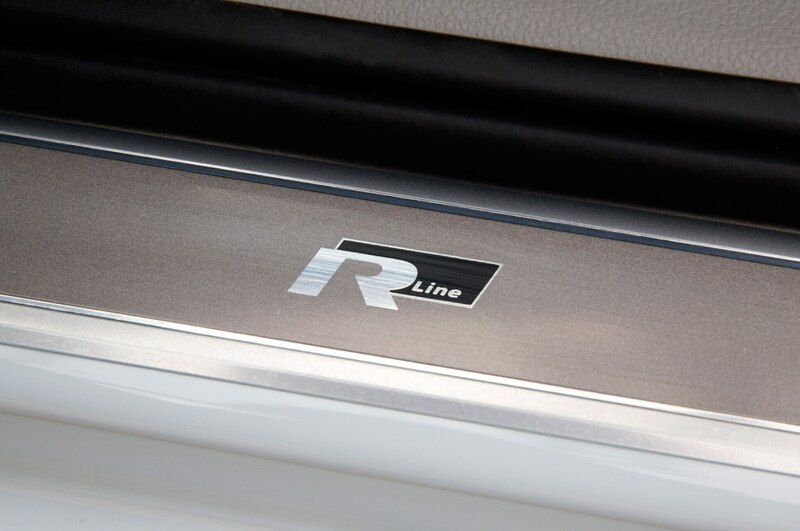 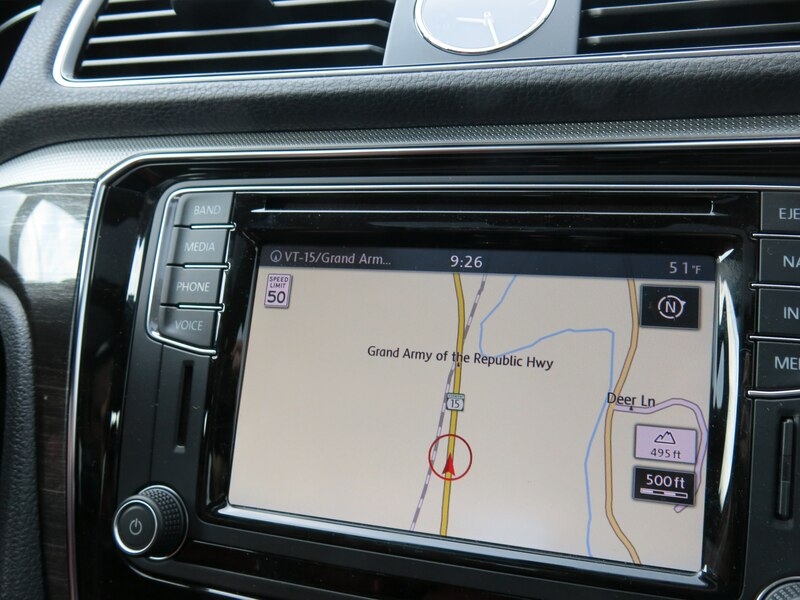 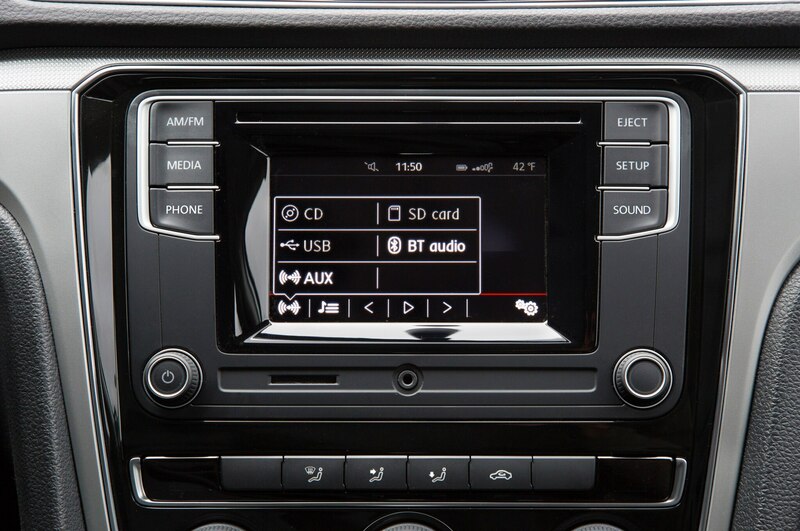 The base S model comes decently equipped with a USB port, Bluetooth connectivity, rearview camera, and 5.0-inch touchscreen with VW’s latest MIB II software. 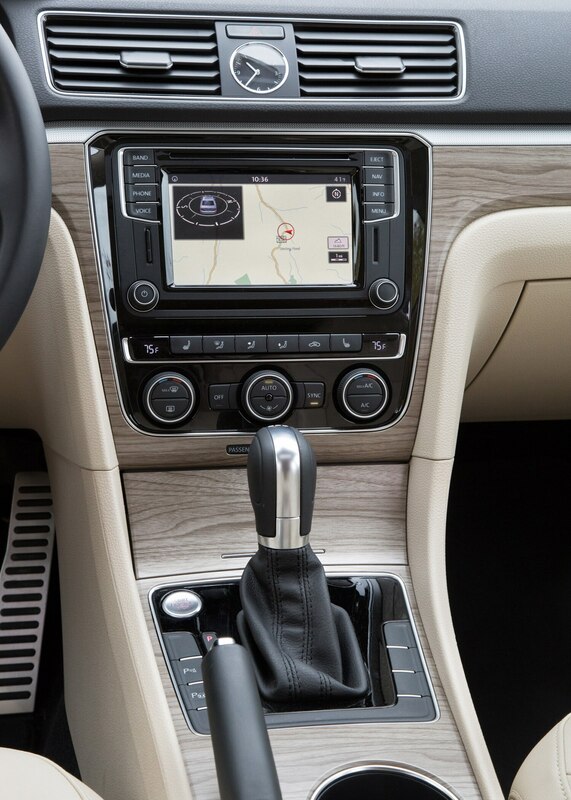 Stepping up to the SE model gets you a second USB port, a larger 6.3-inch interface, adaptive cruise control, forward collision warning with automatic emergency braking, and heated seats, and adding the $2,130 Technology package tacks on passive blind-spot monitoring, keyless entry with push-button start, navigation, rear-cross traffic alert with automatic braking, and heated rear seats. 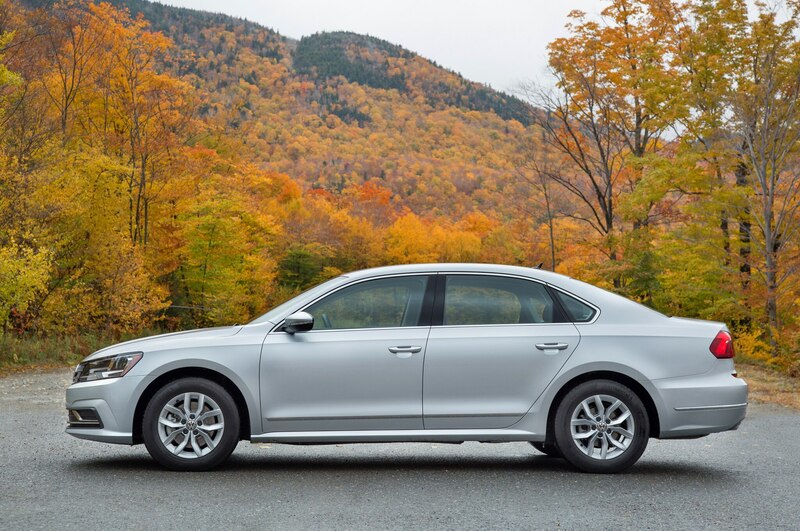 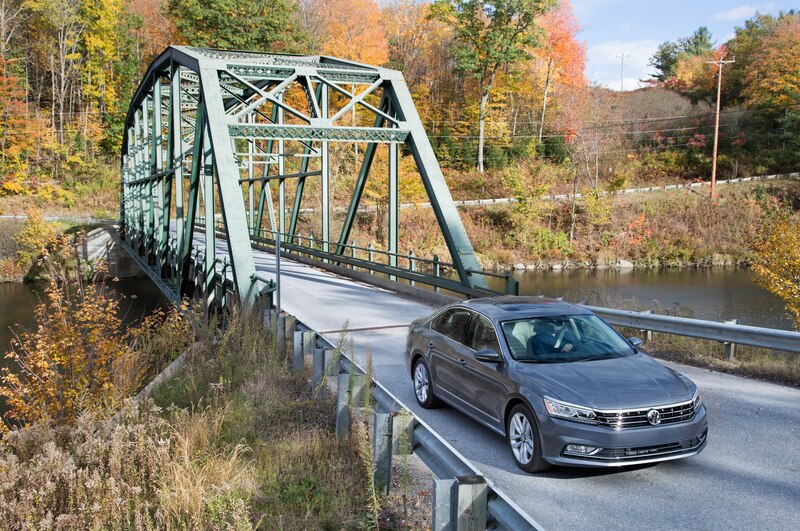 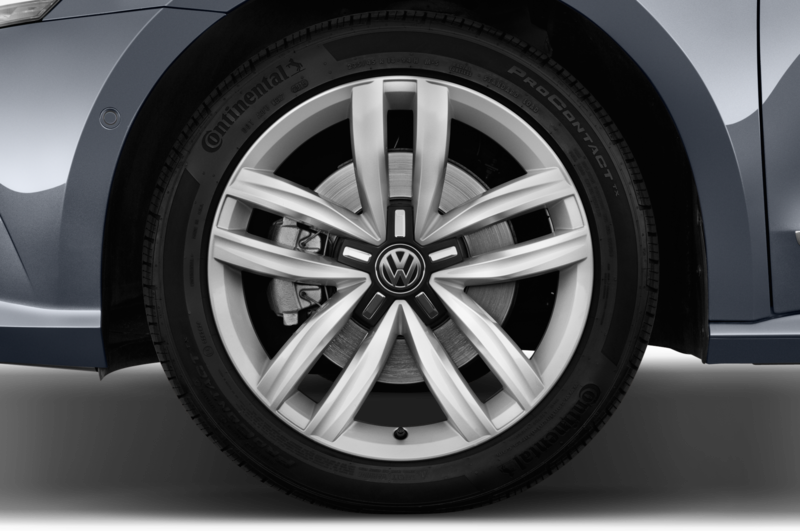 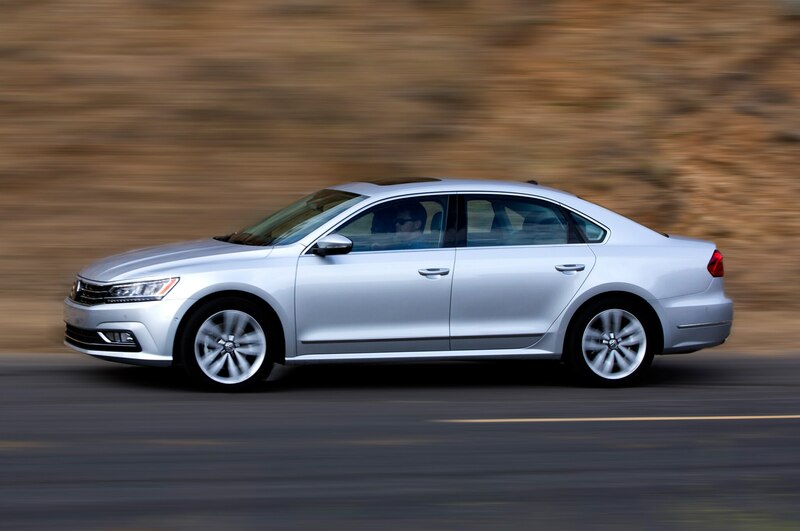 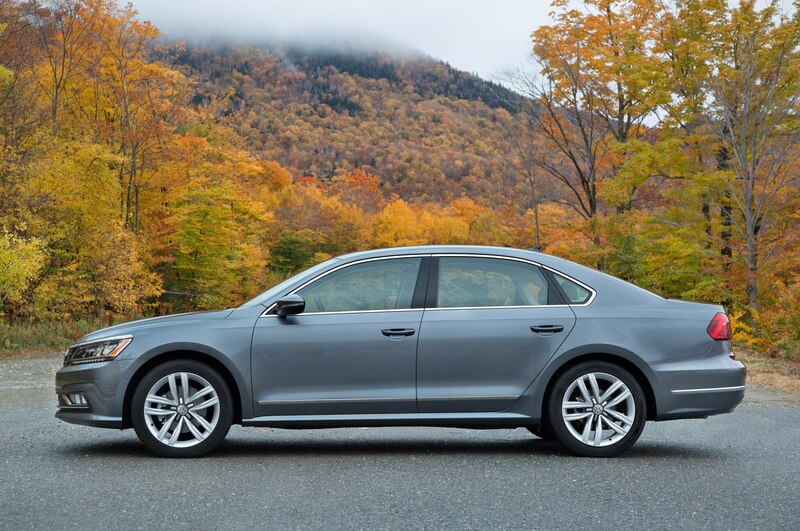 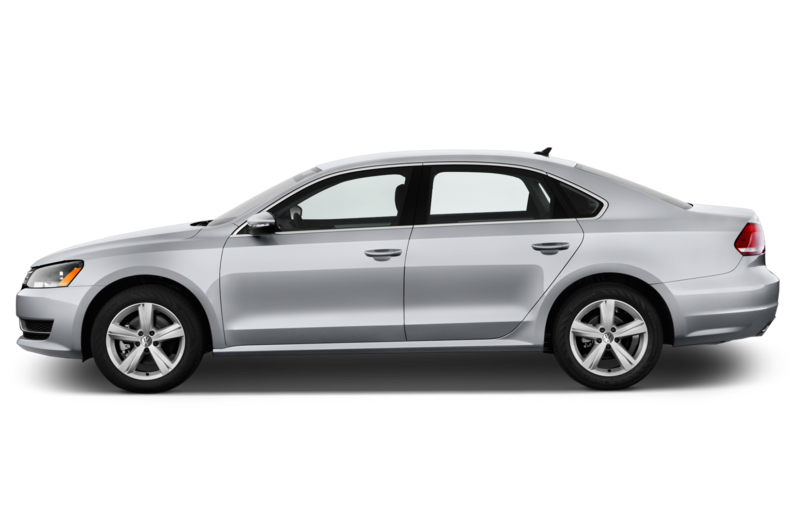 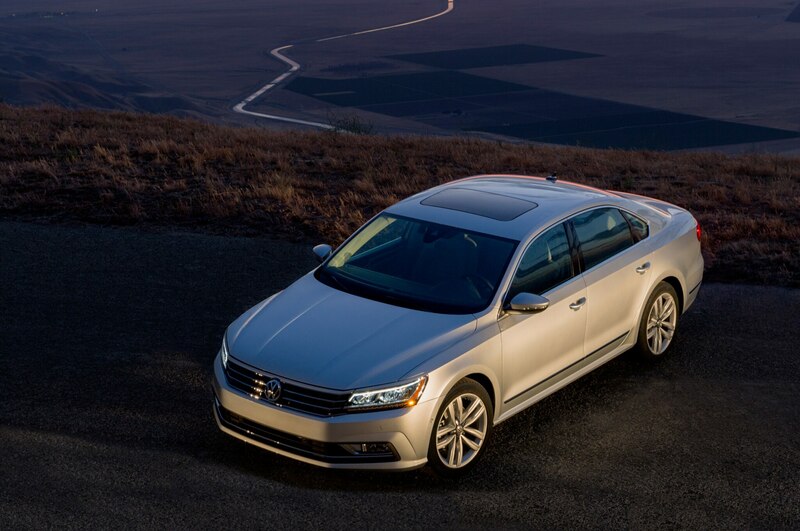 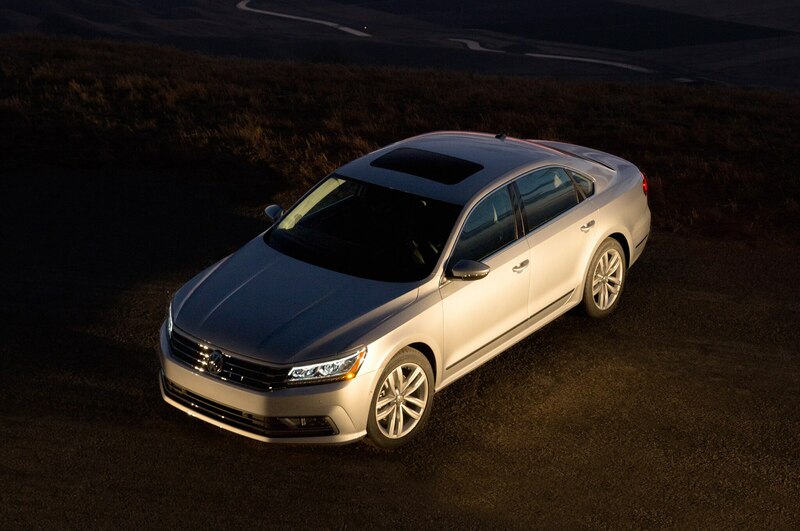 While higher-spec SEL and SEL Premium trims have Fender audio, leather seats, lane-keeping assist, park distance control, park assist, and active steering correction tied in with blind-spot monitoring, the 2016 Volkswagen Passat SE or SE with Technology prove the strongest entries of the lineup, offering the best balance of equipment and affordability at under $30,000. 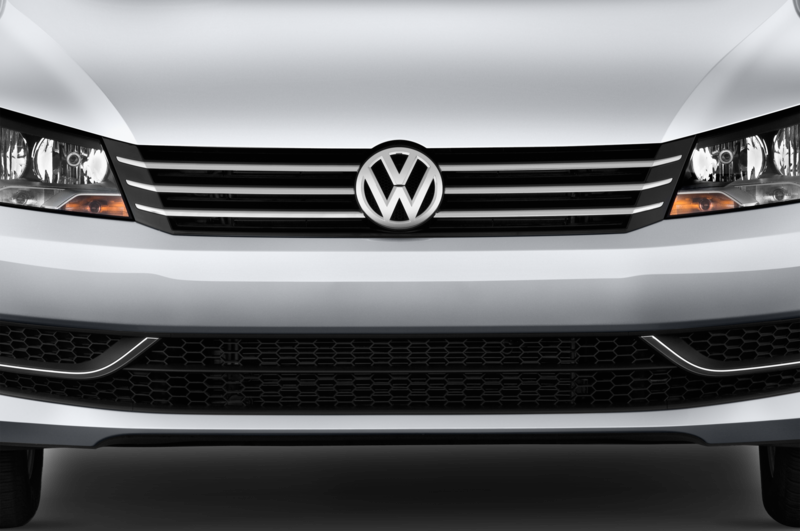 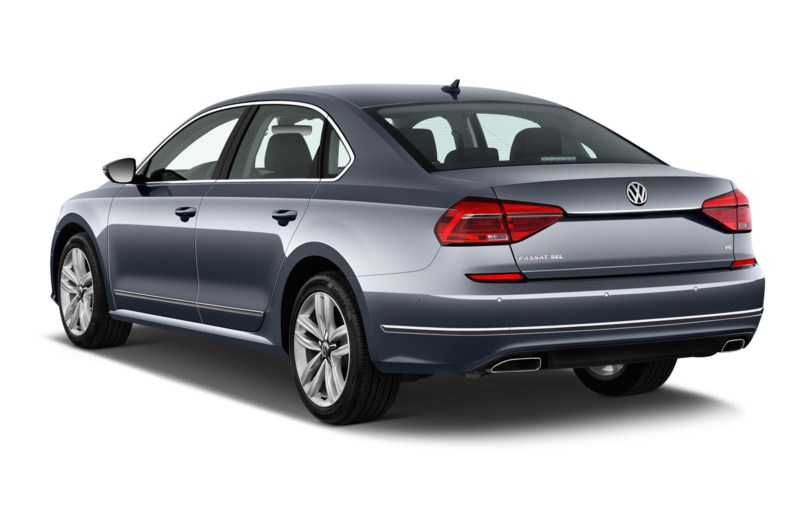 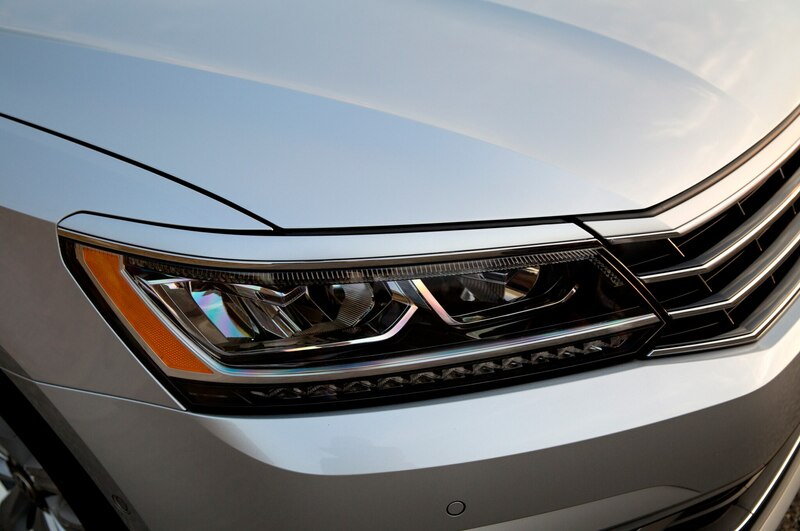 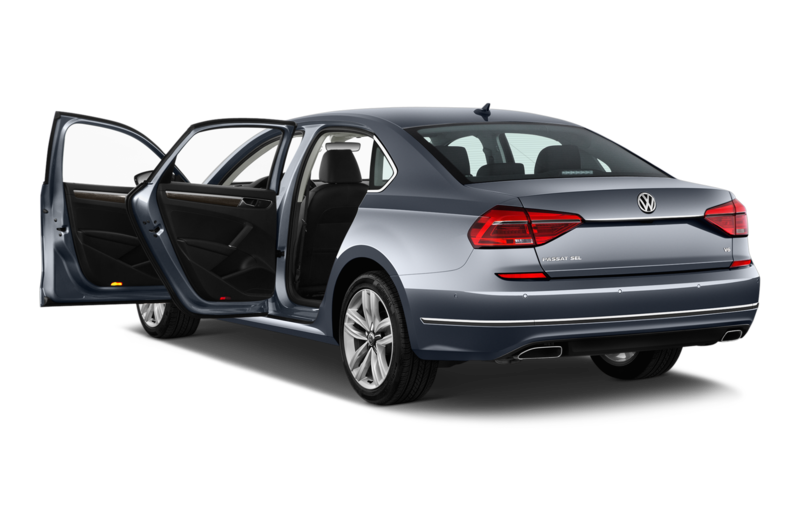 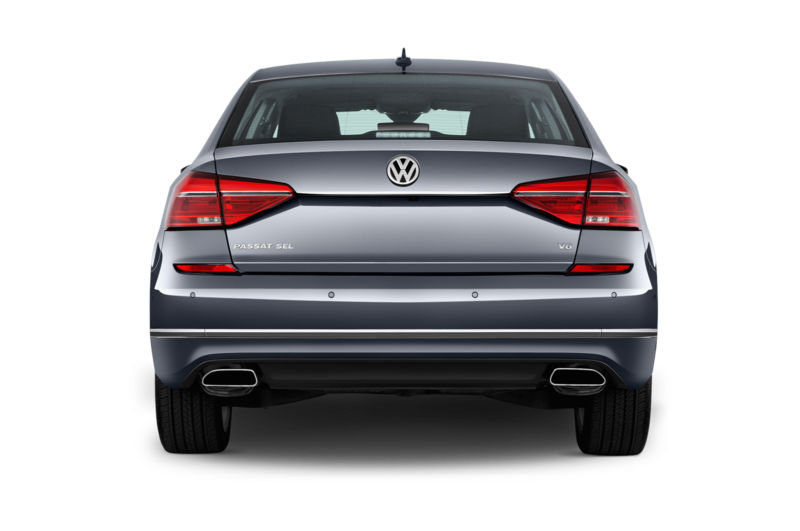 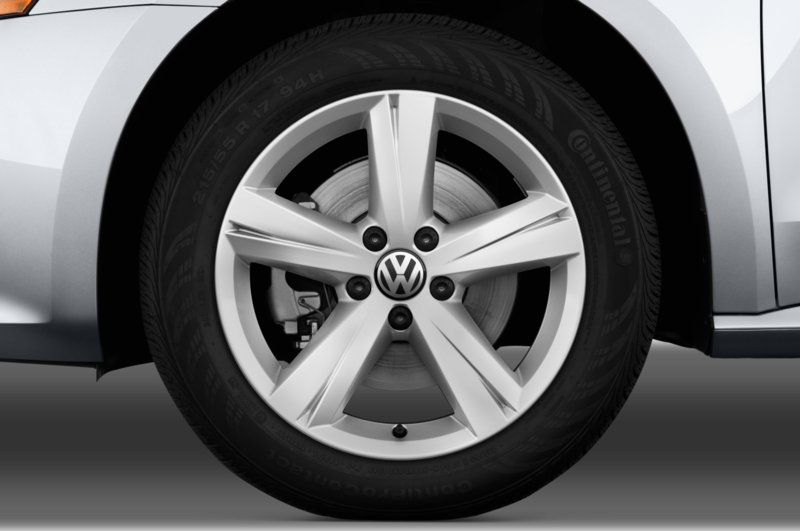 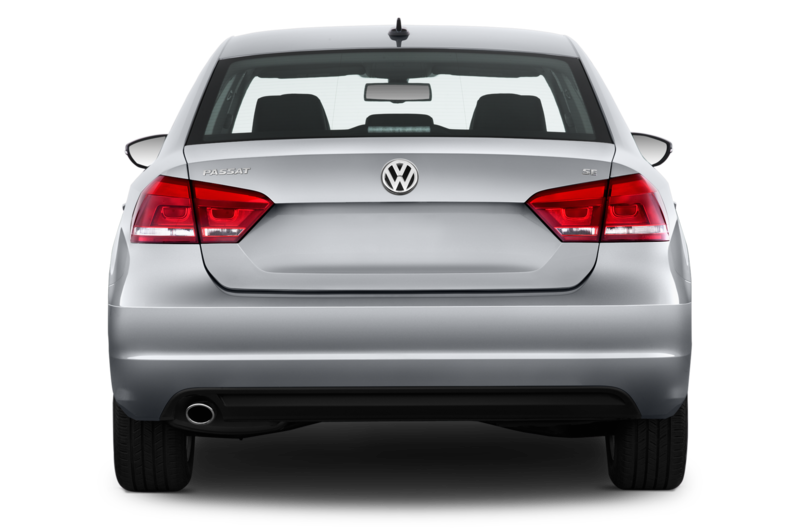 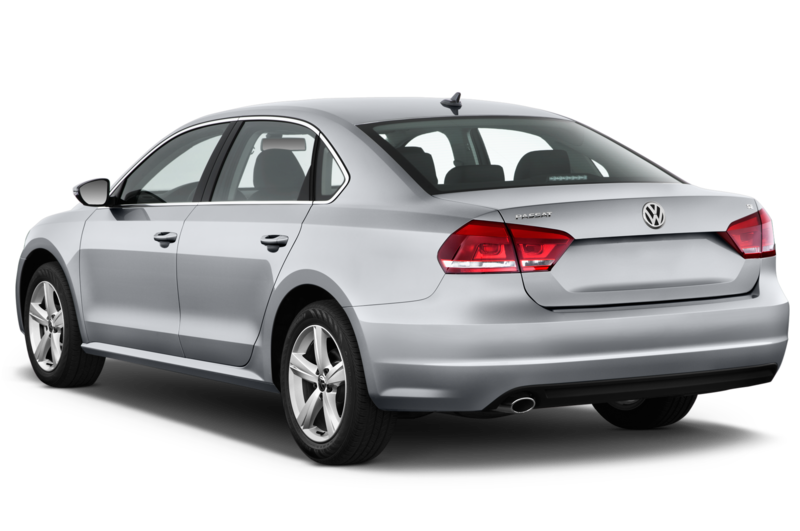 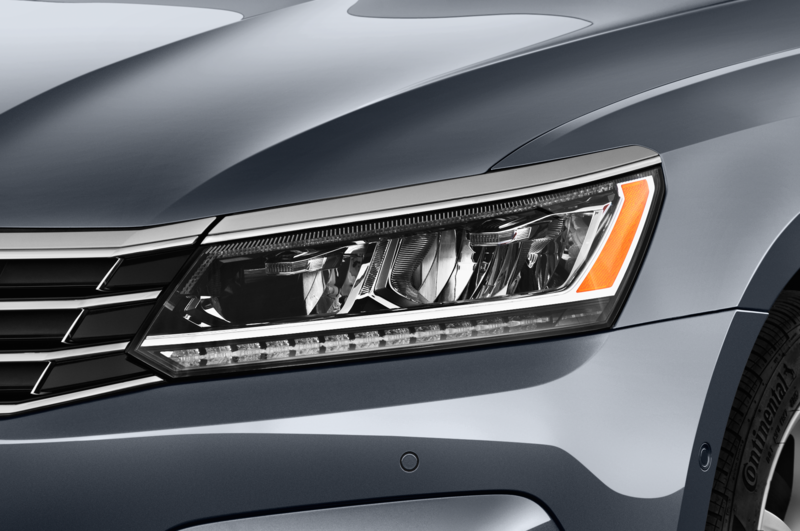 The 2016 Volkswagen Passat has more defined lines on its hood, narrower headlights, a wider-looking rear bumper, and standard chrome trim. 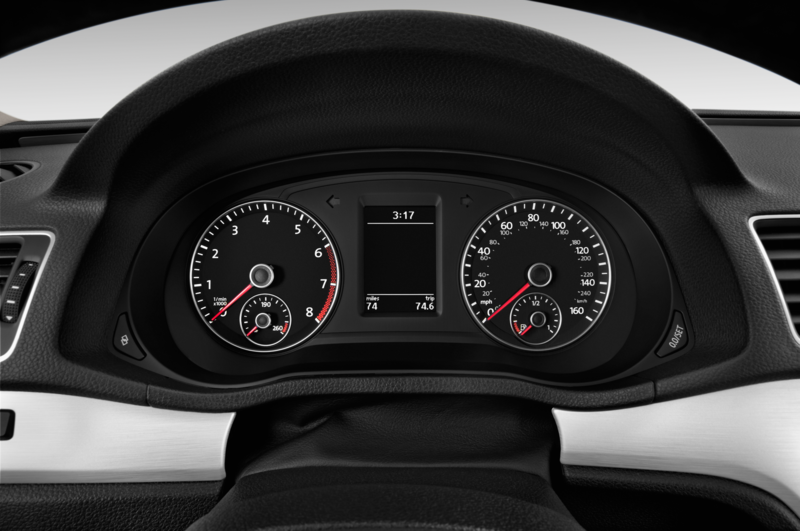 That’s about all the change you can see. 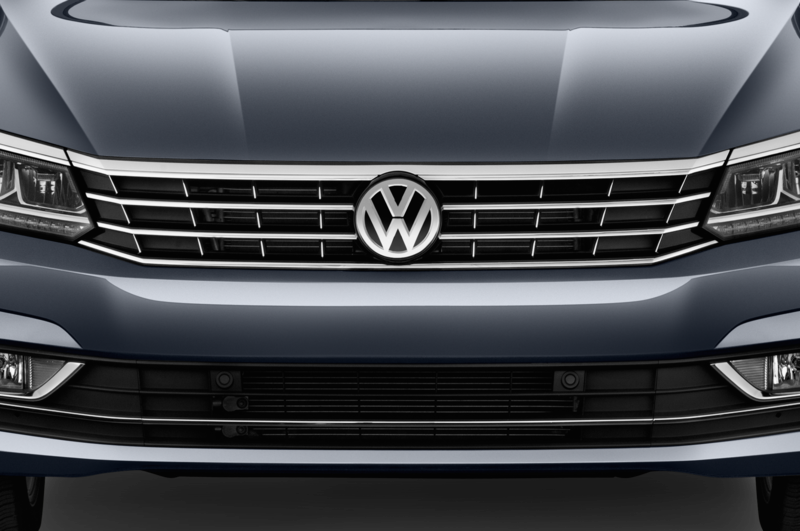 It’s a very conservative refresh to an already restrained design. 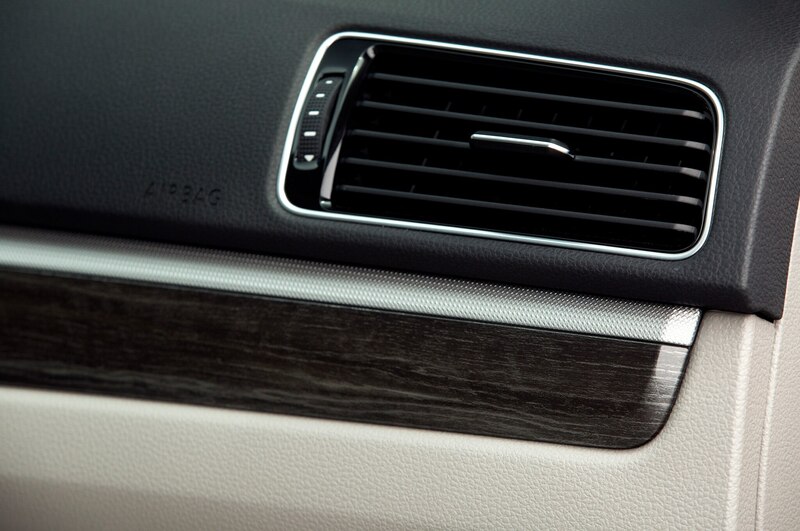 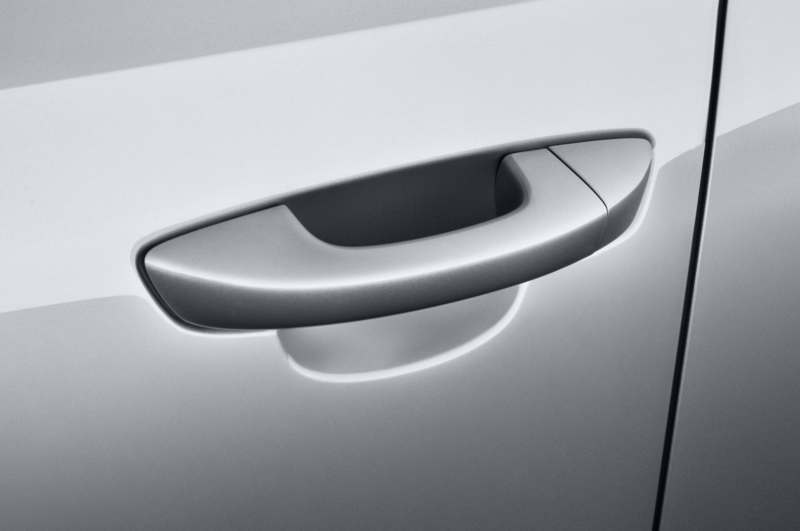 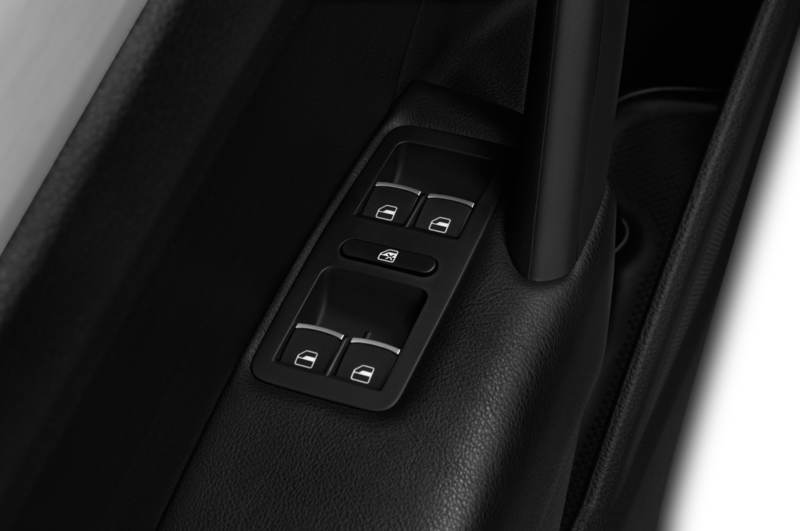 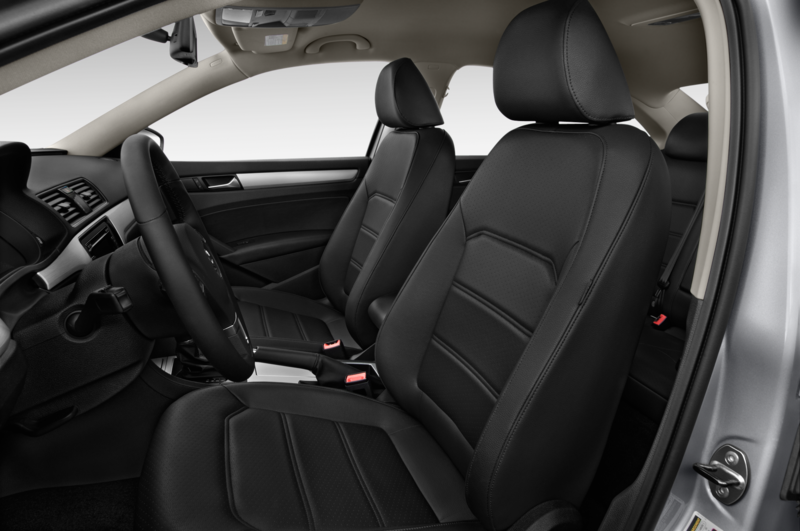 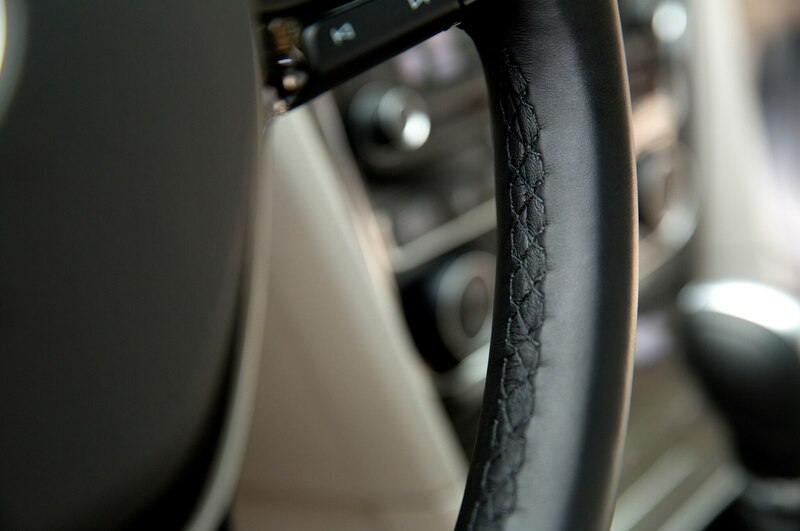 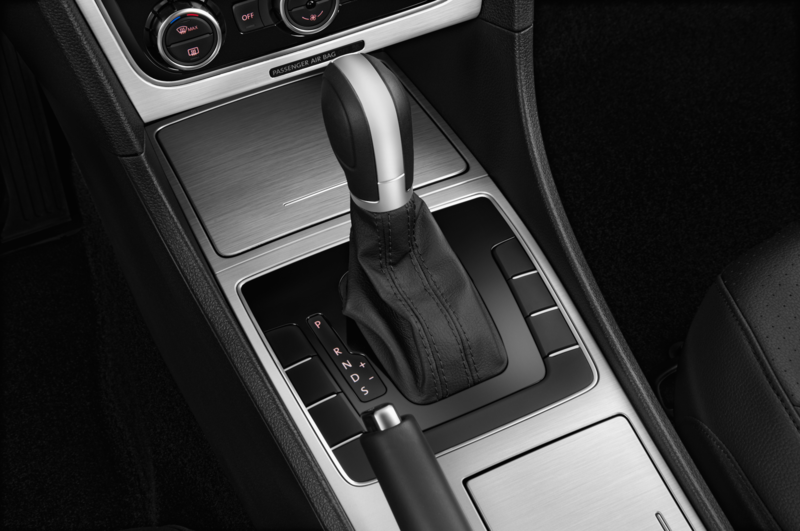 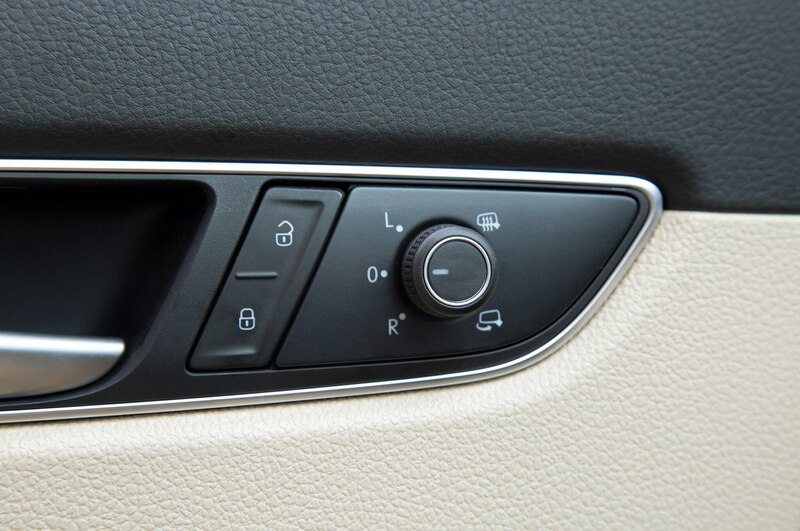 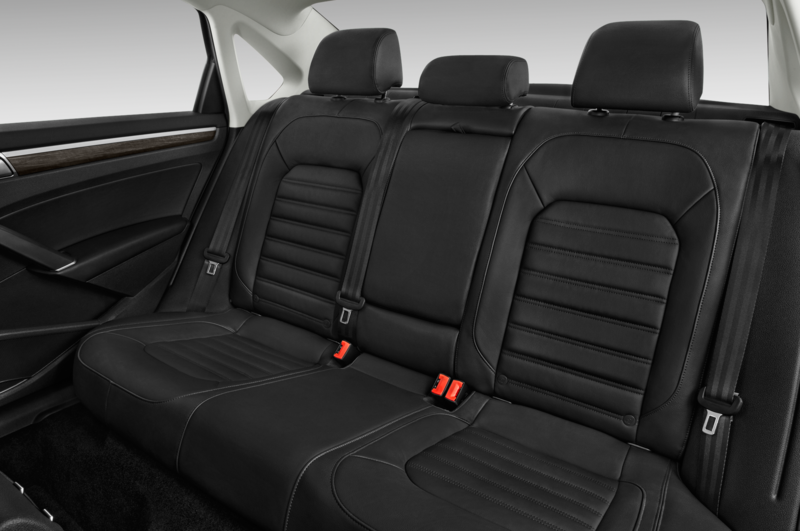 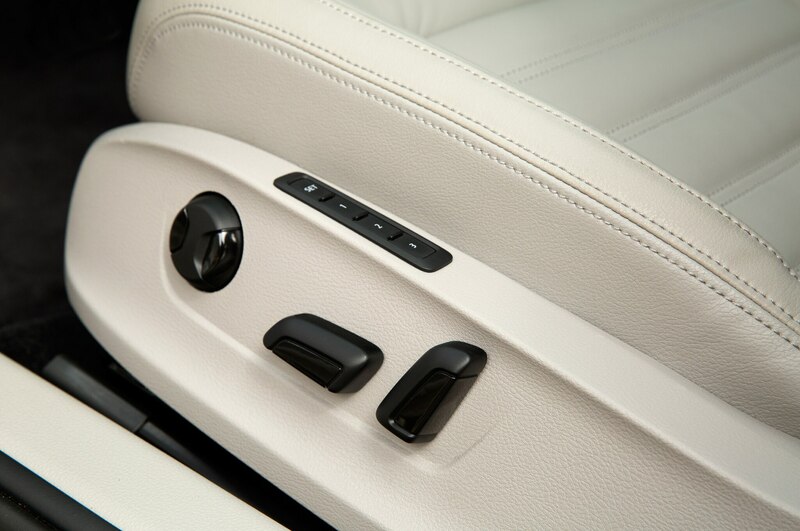 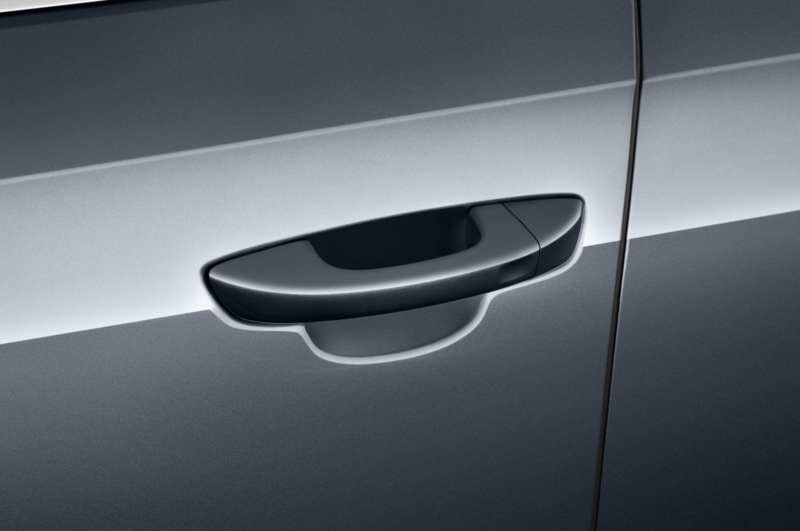 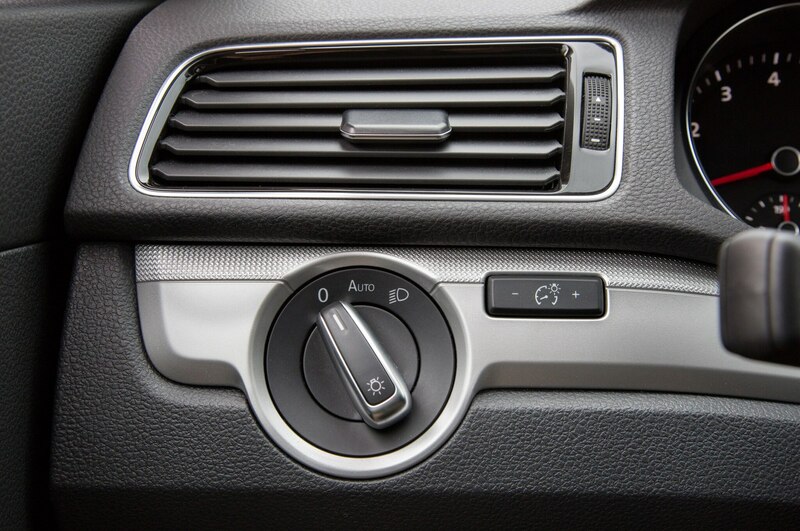 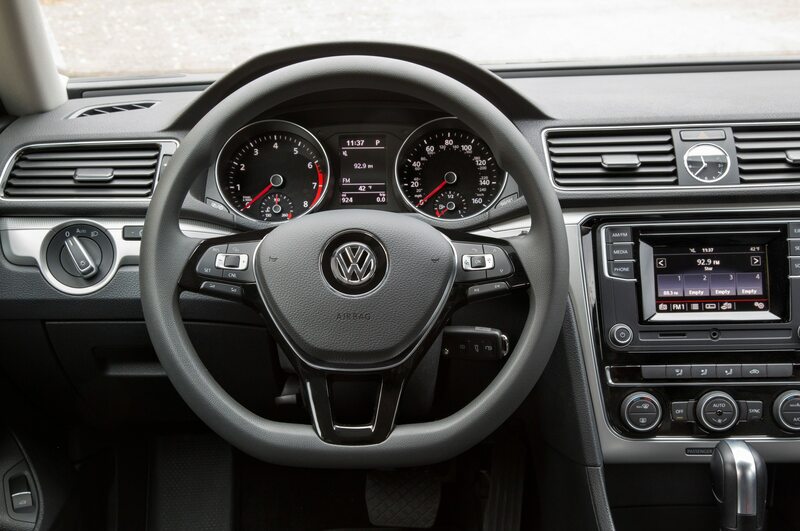 VW applied the same deft hand to the Passat’s interior. 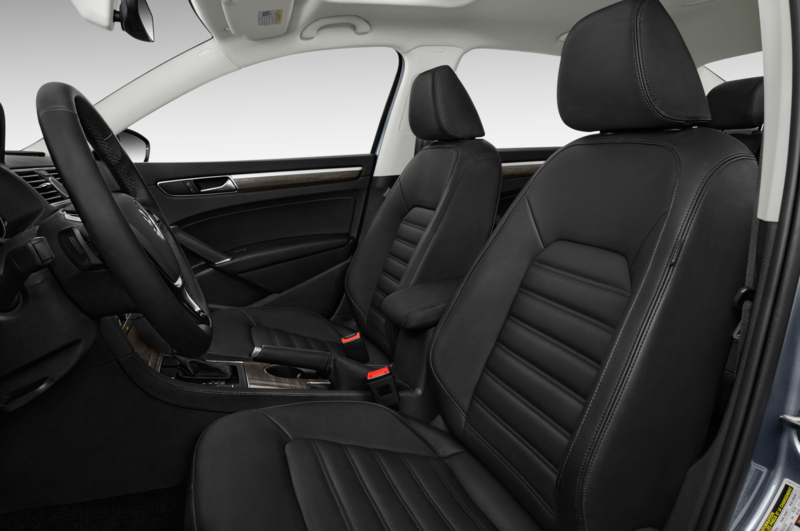 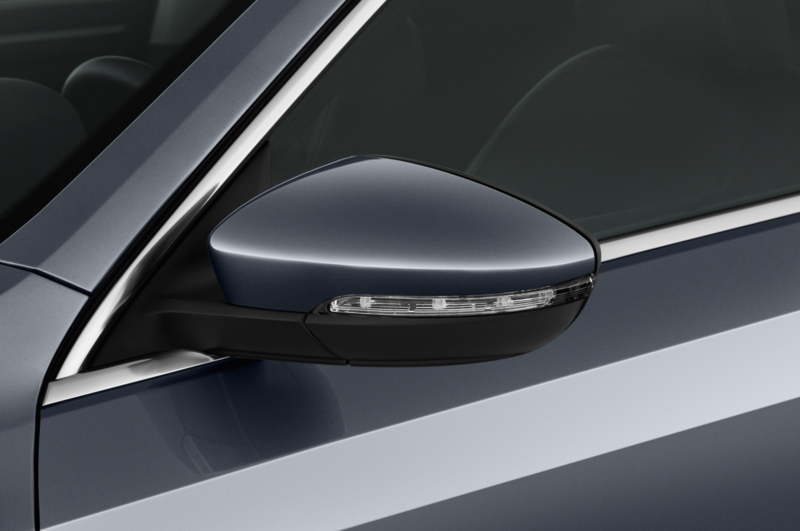 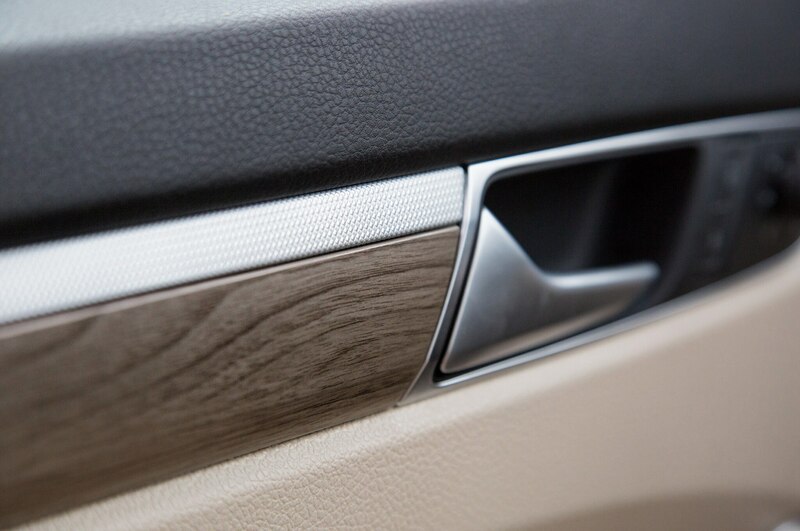 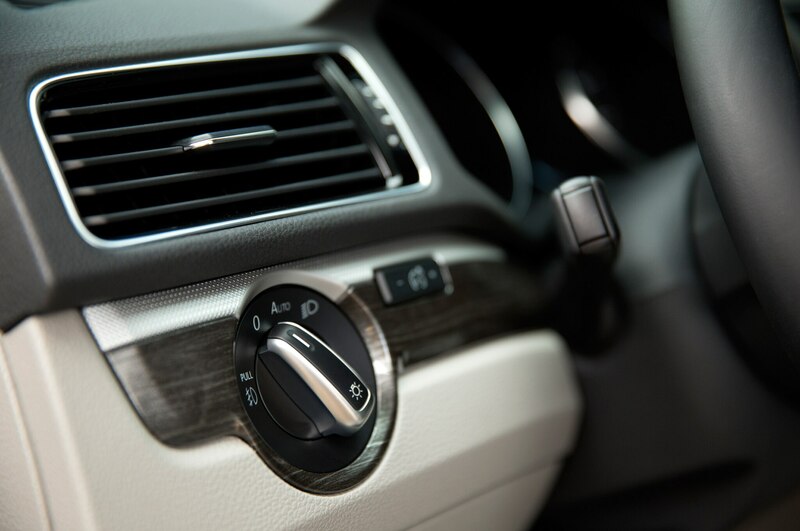 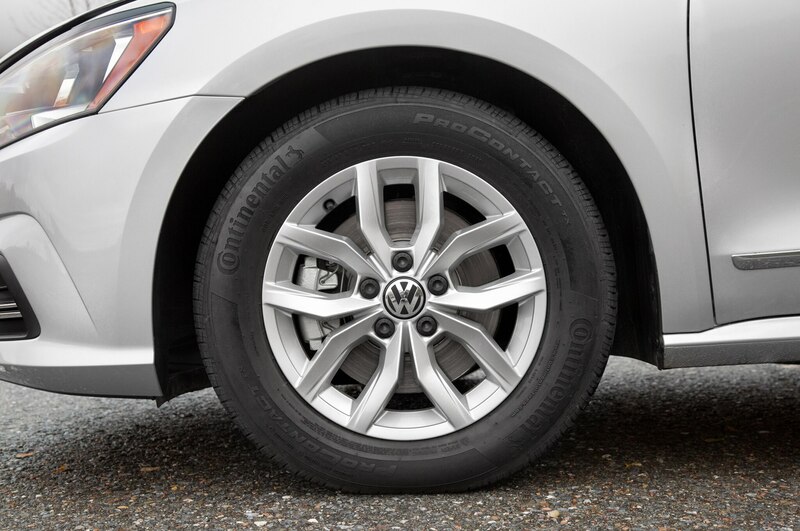 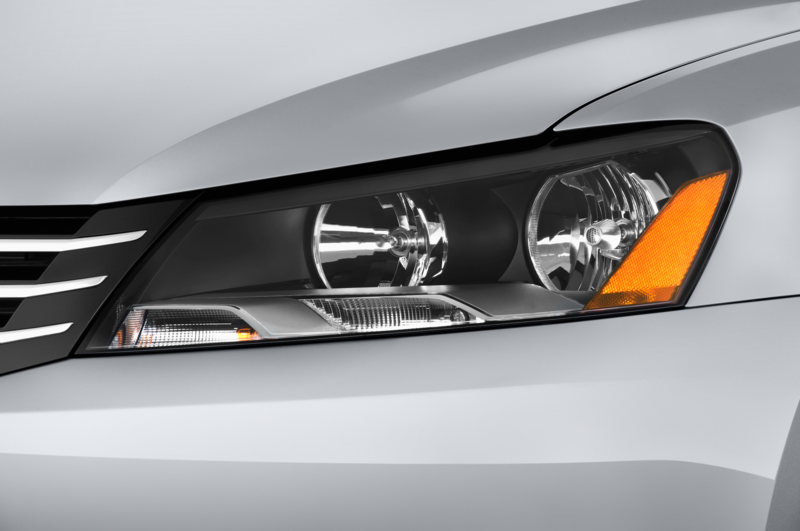 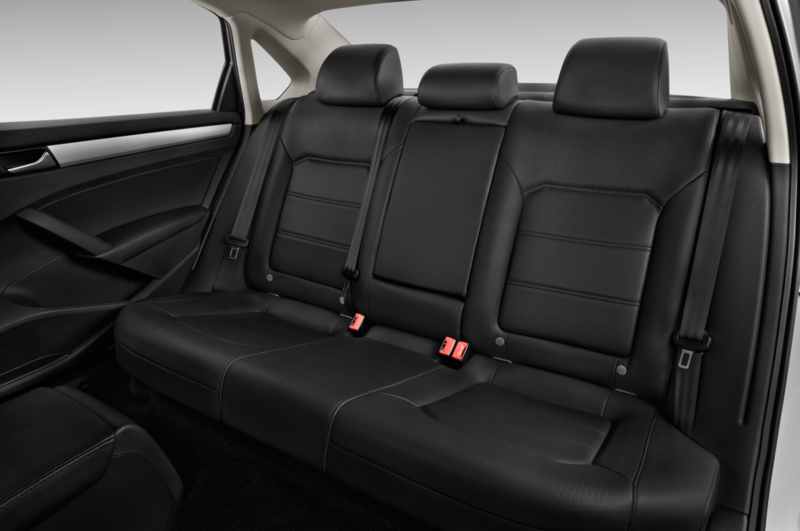 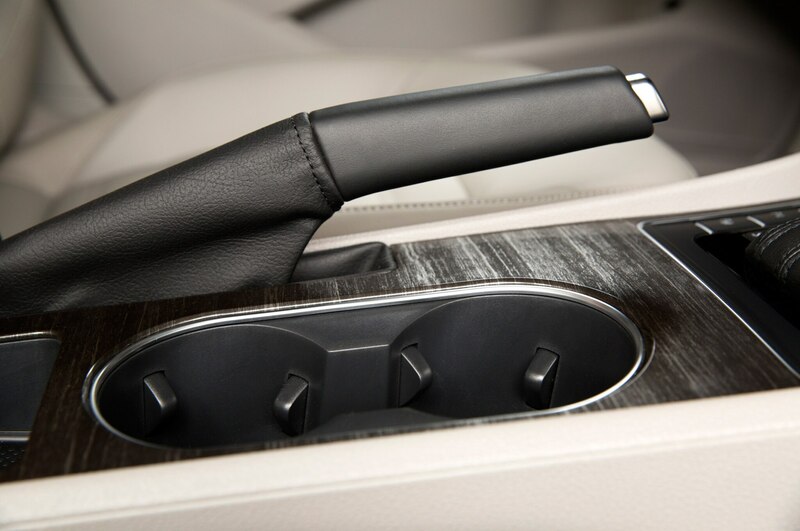 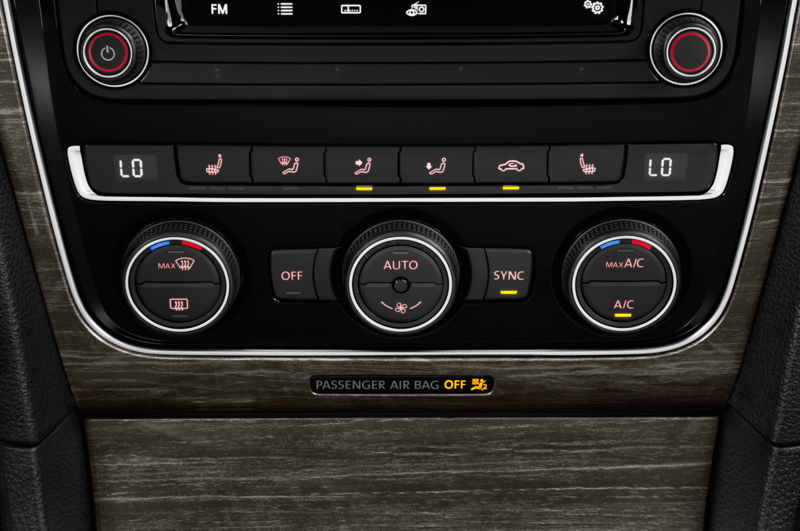 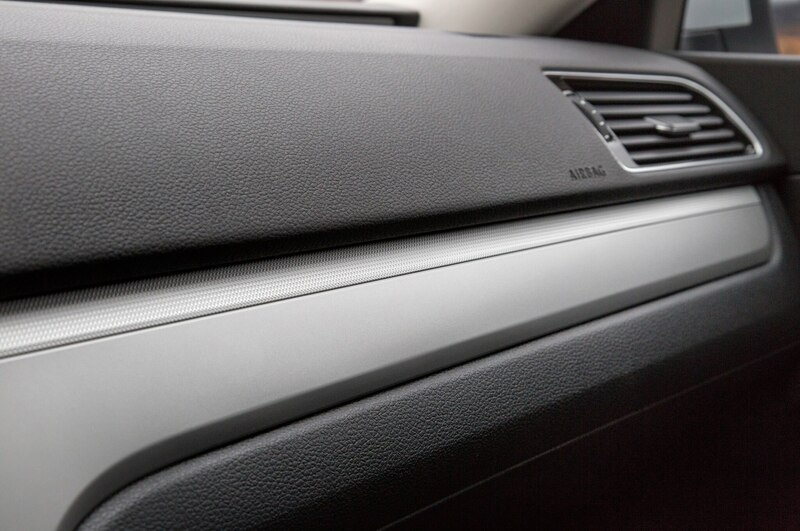 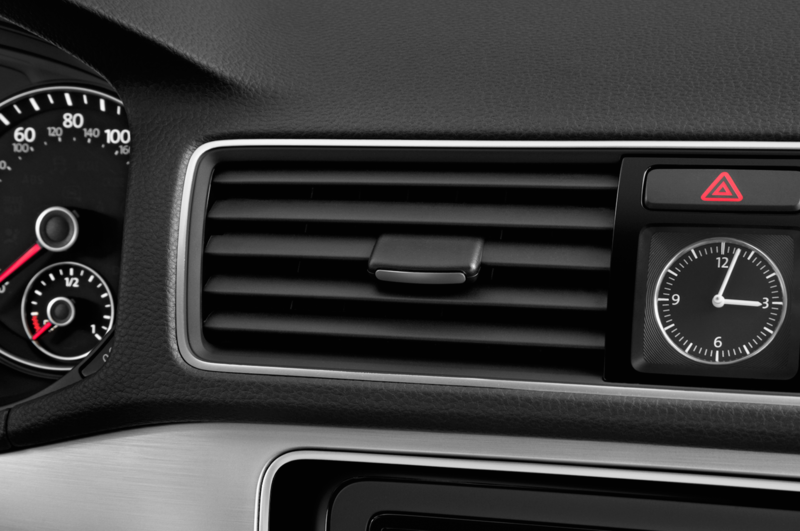 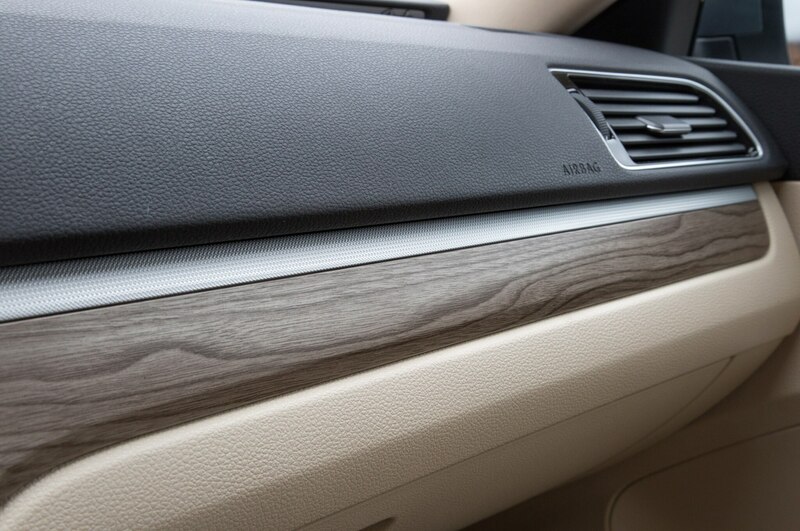 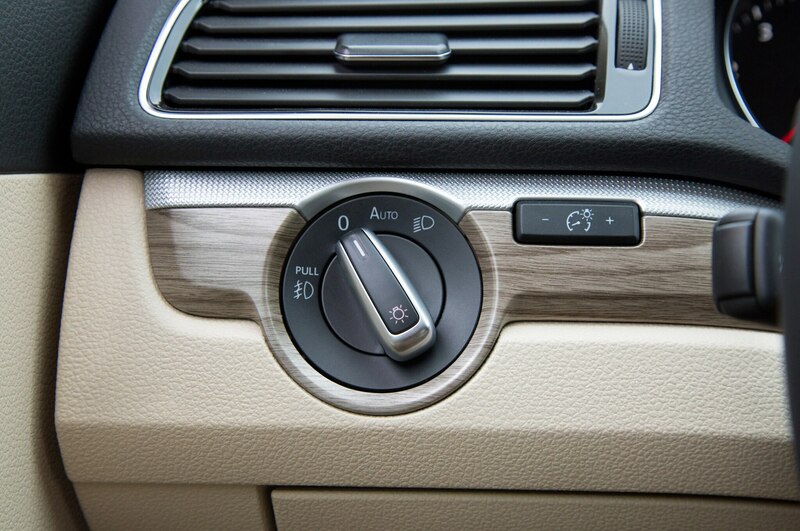 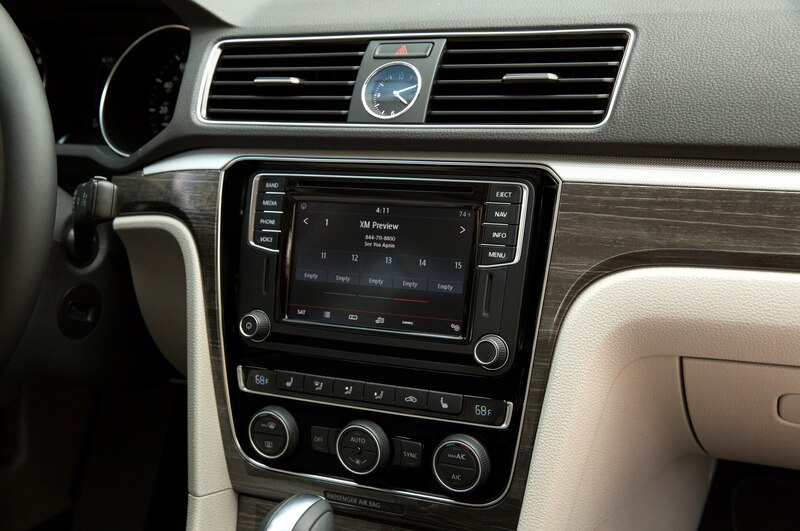 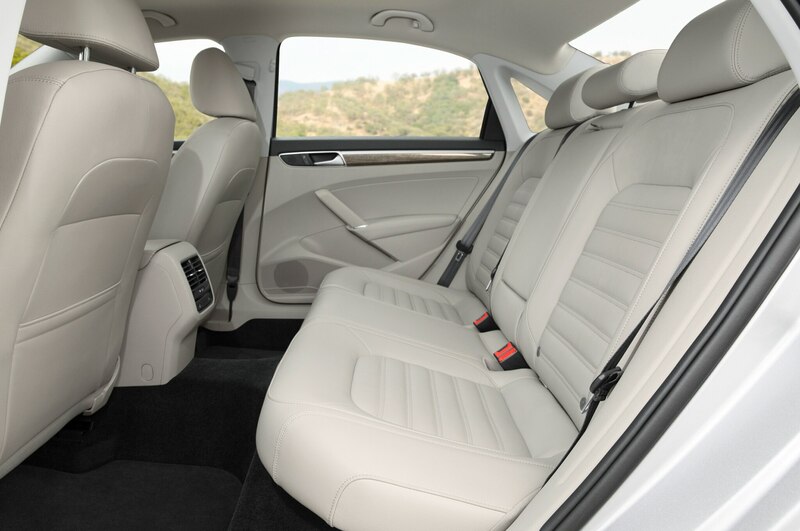 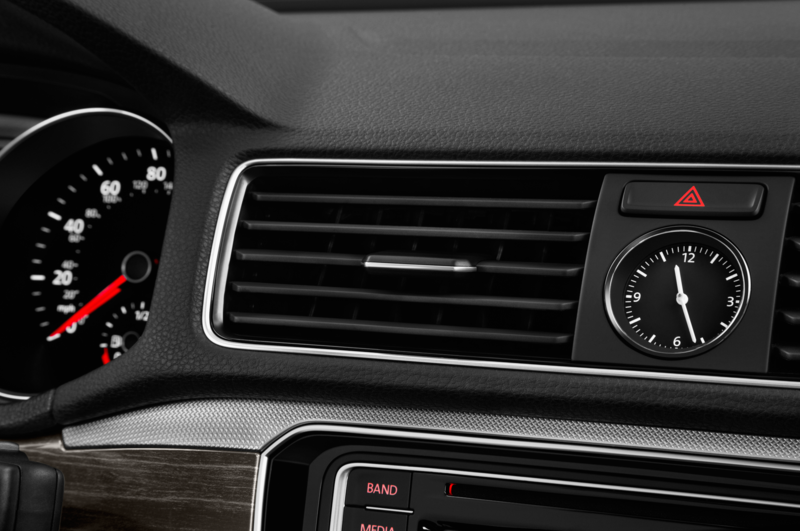 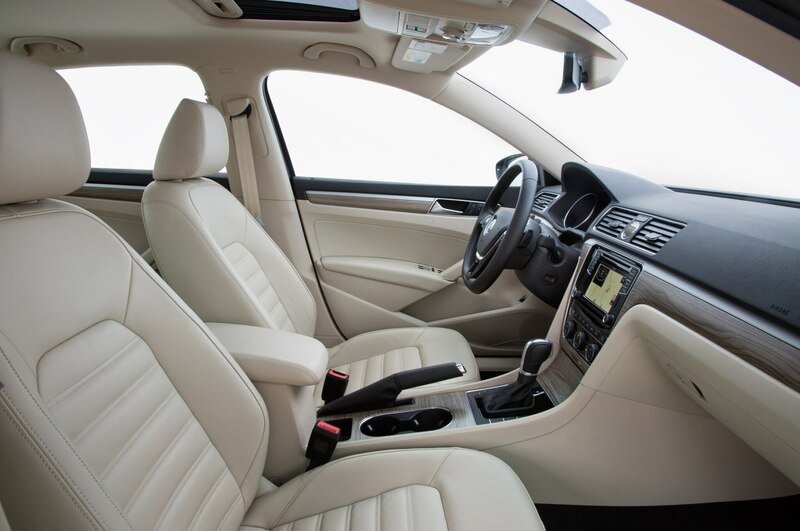 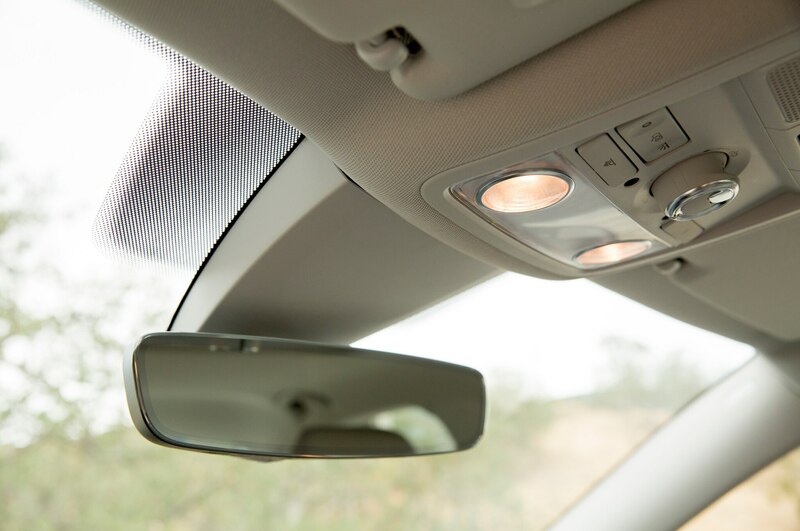 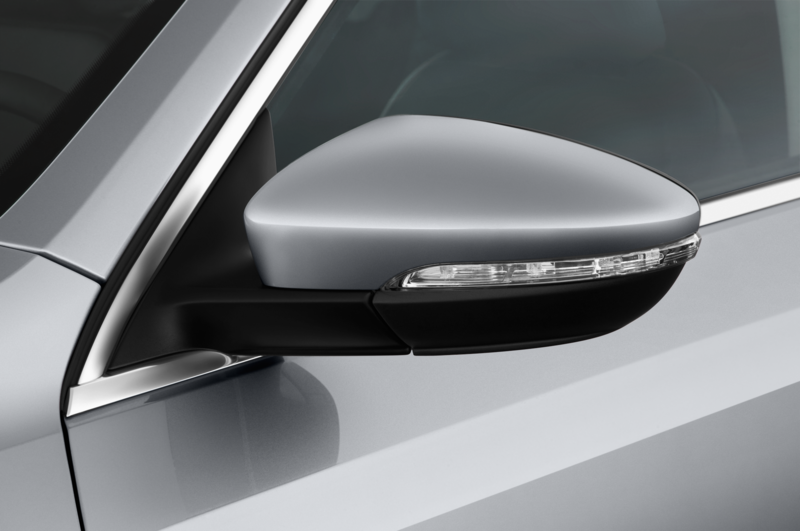 The center stack integrates neatly into a new two-tone décor; while the old Passat looked somewhat naked with simple faux-wood inserts on the dashboard, this Passat has an upper layer of aluminum-looking plastic bezels that add a bit more pop. 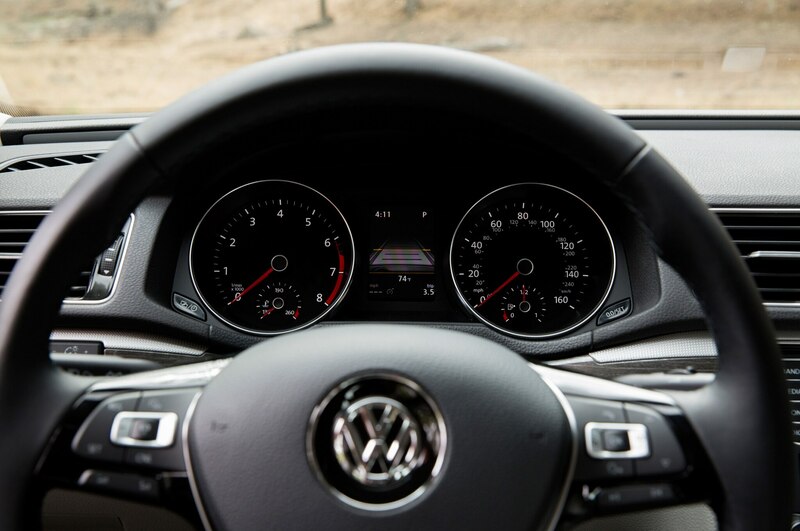 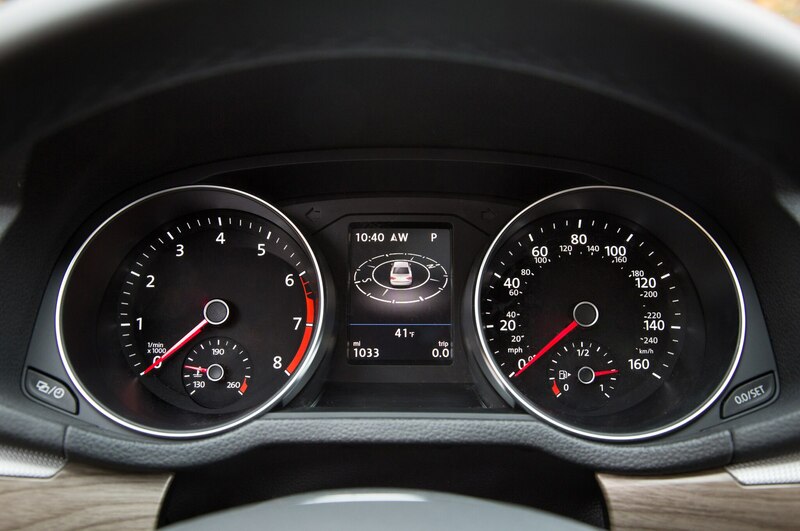 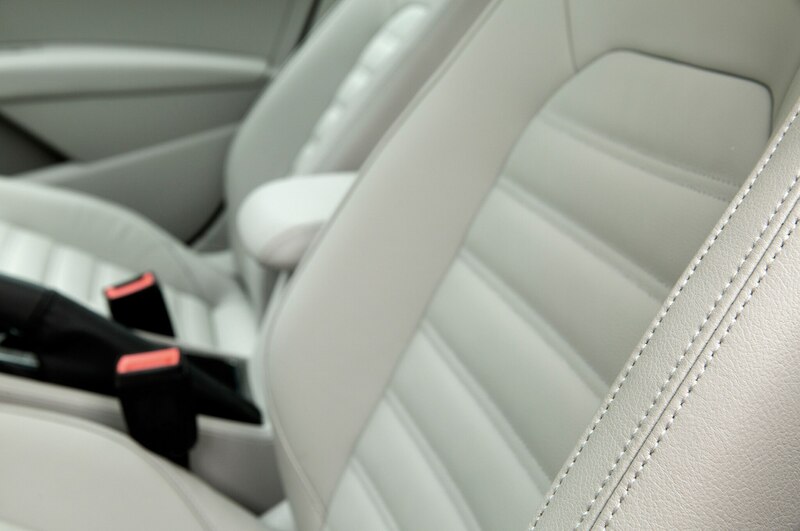 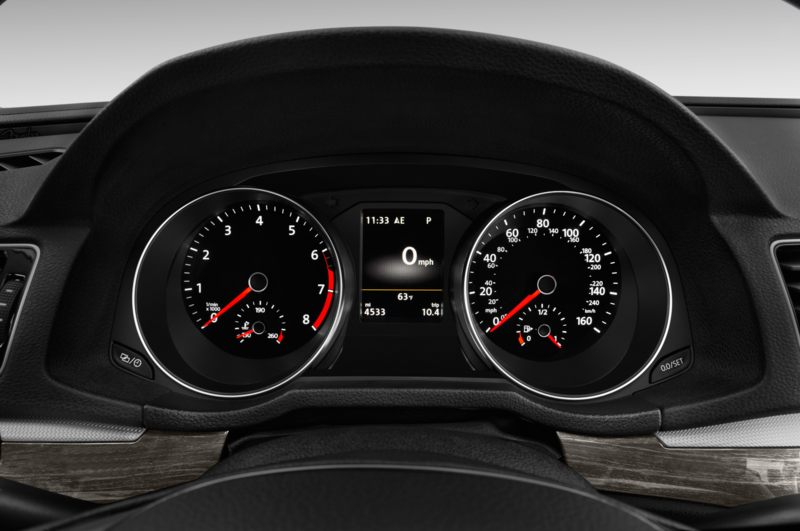 We’re happy to see the leather-wrapped three-spoke steering wheel, piano black trim, and clear gauges have migrated over from the Golf but most other upgrades, including new upholstery and a frameless rearview mirror, largely fly under the radar. 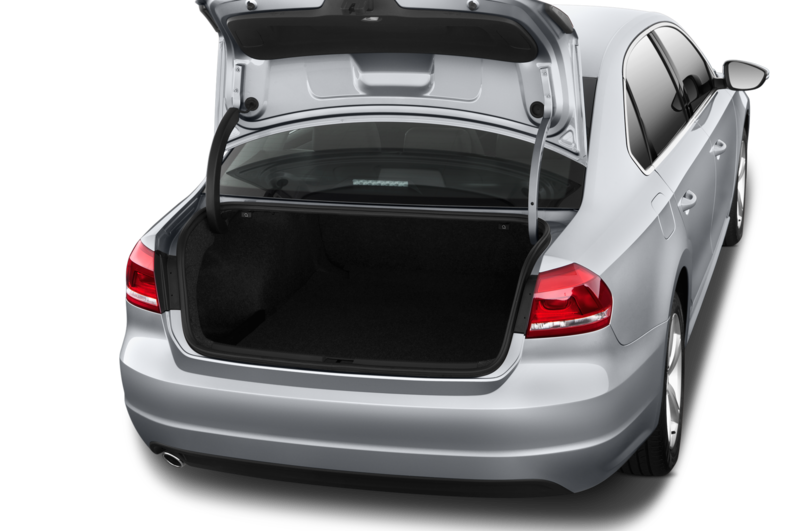 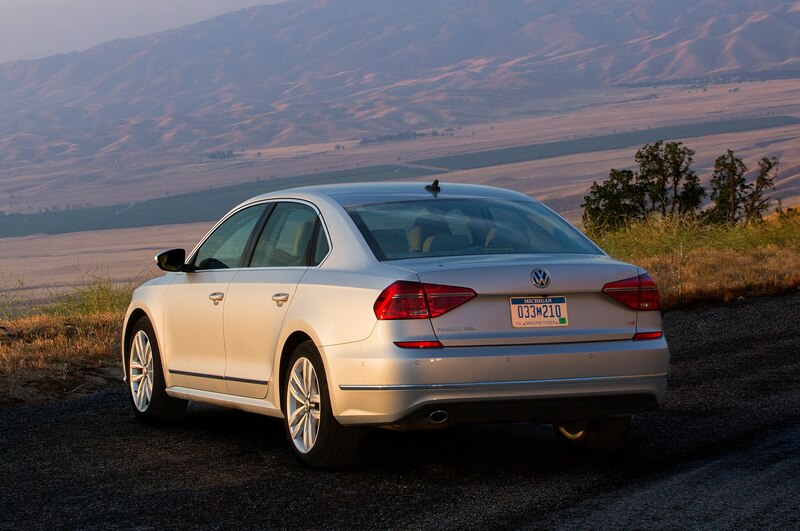 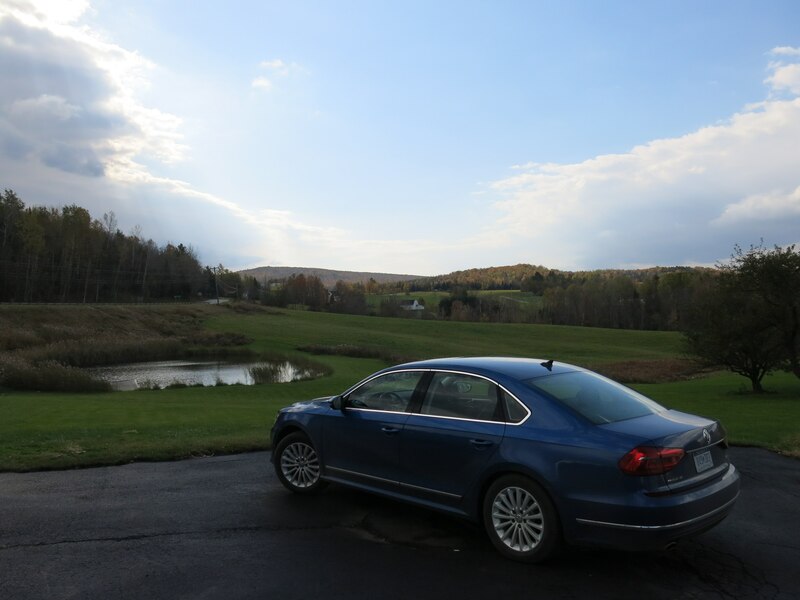 The major pieces VW got right when it first launched the built-in-America-for-America Passat in 2012 are still in intact. 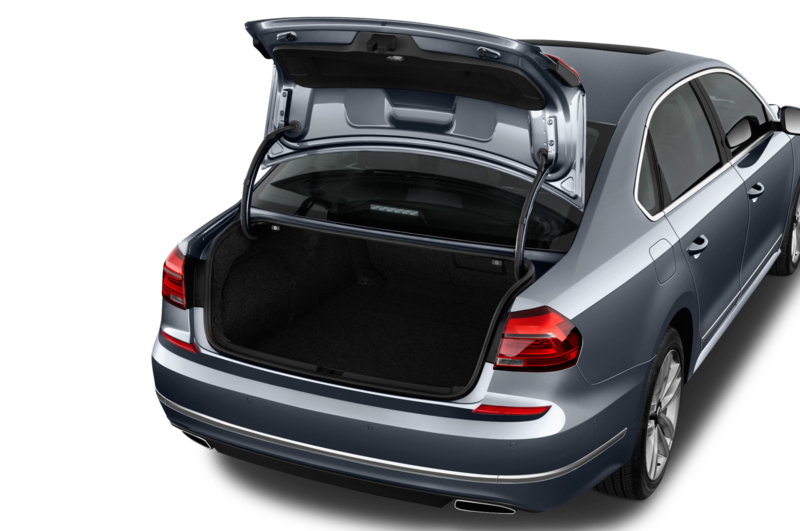 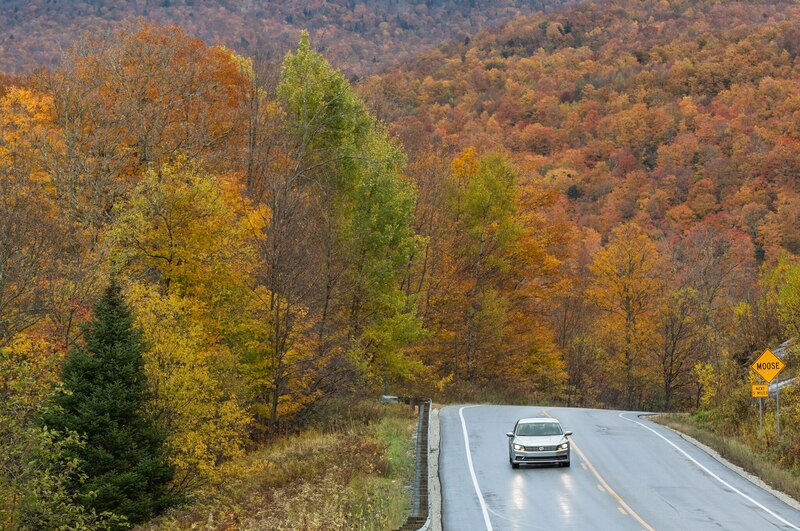 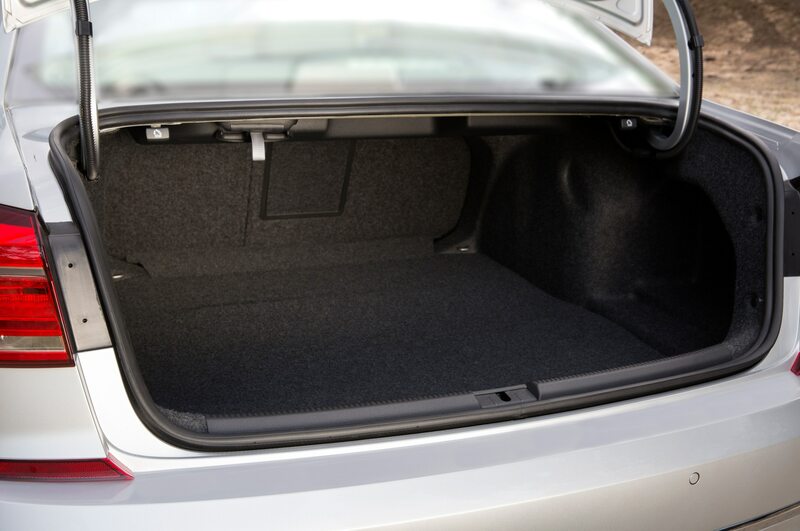 There is still an abundance of legroom and cargo space, the driver is treated to an airy and open cockpit, the ride is as quiet as it is composed, and the car tracks beautifully at highway speed. 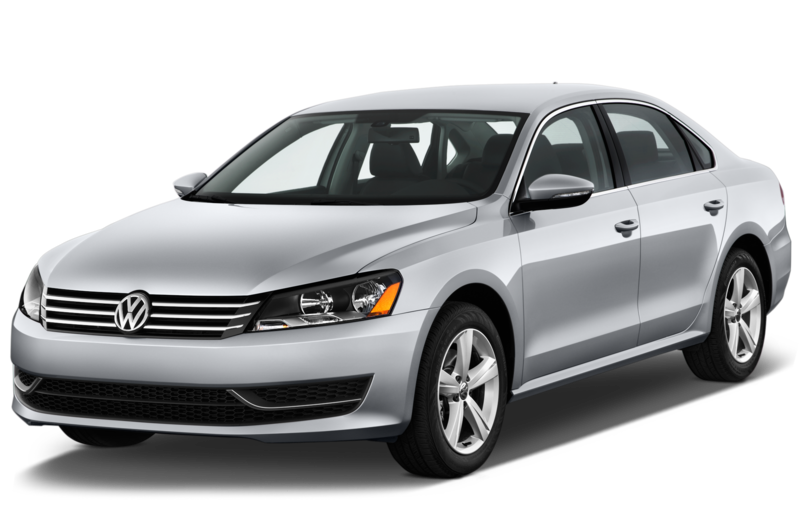 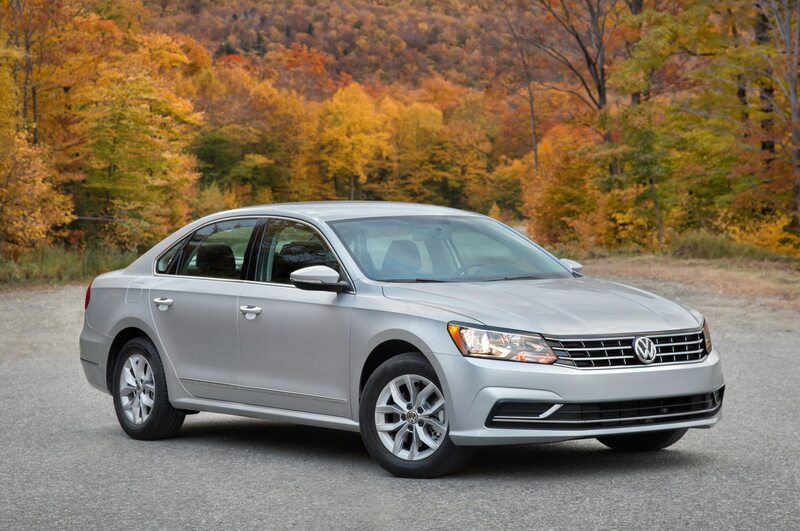 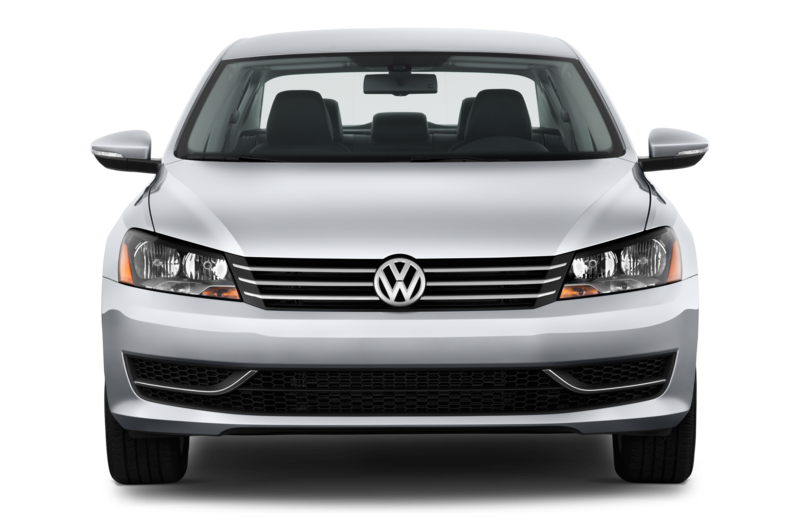 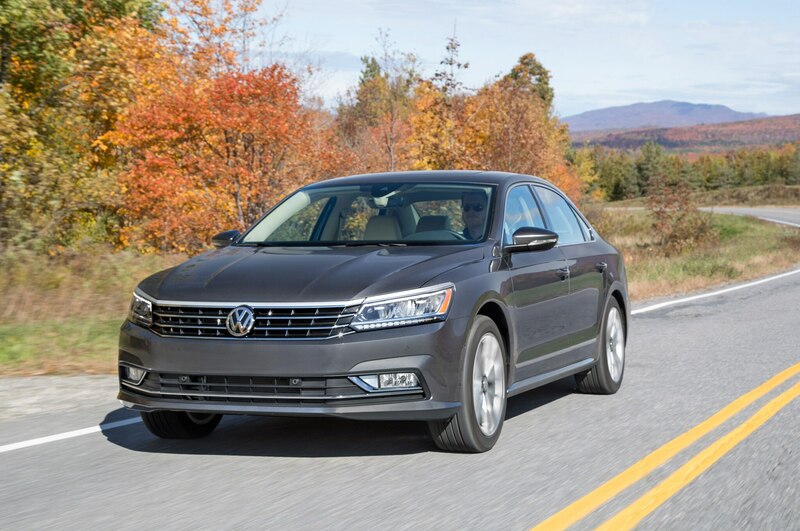 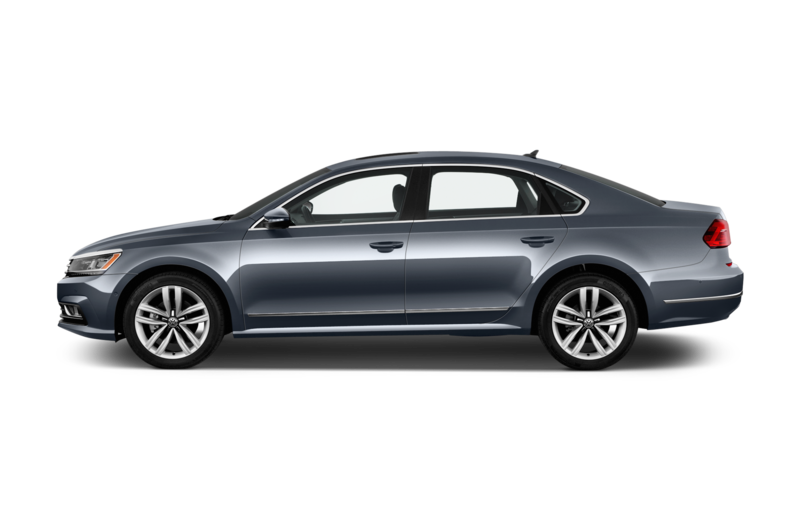 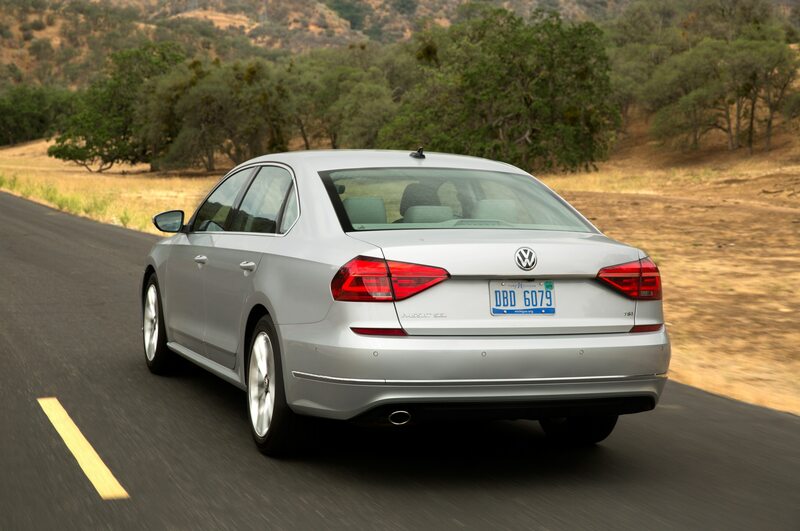 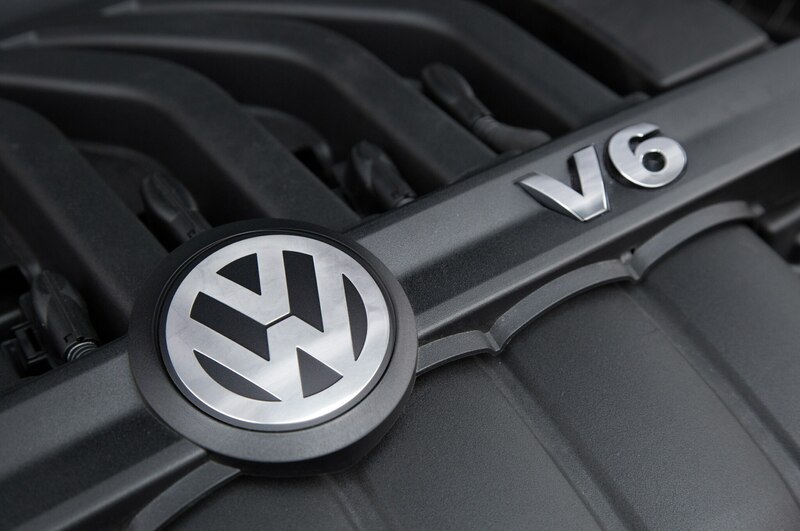 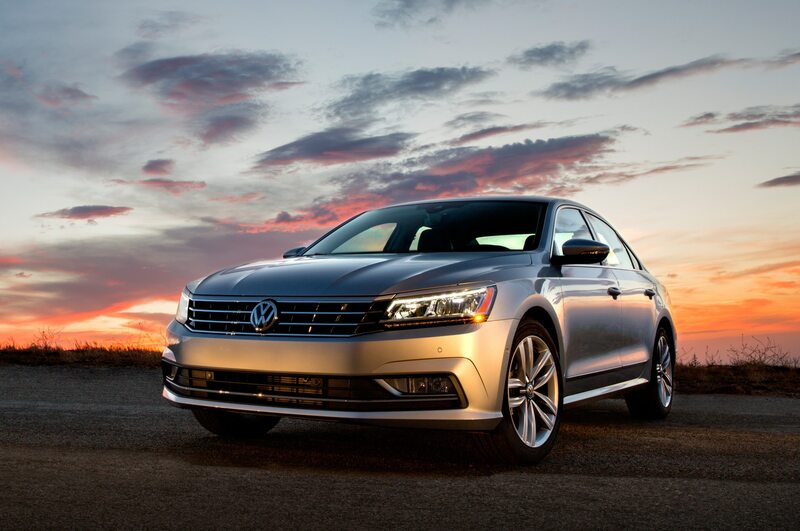 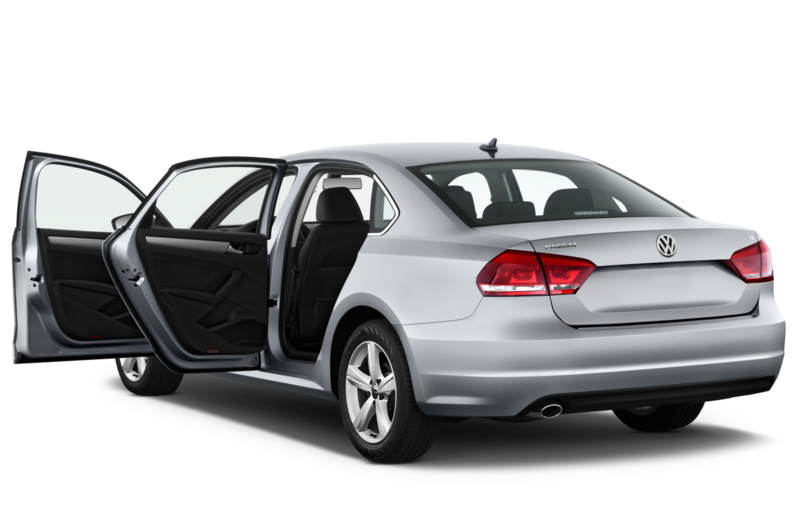 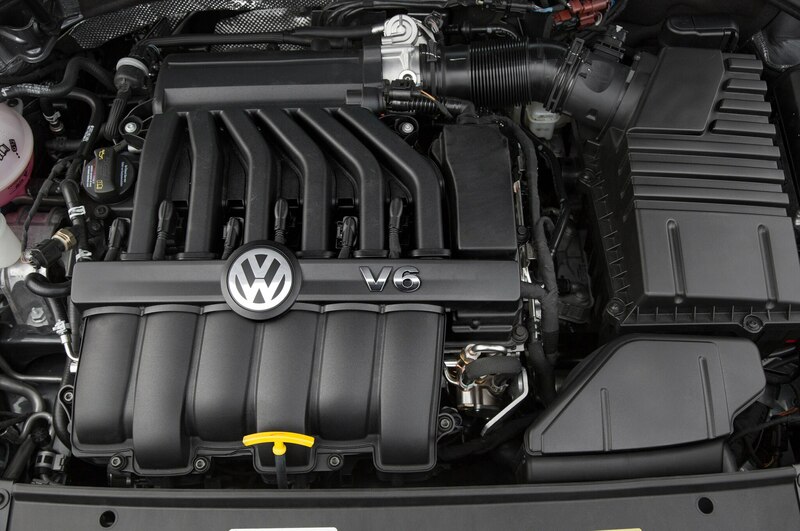 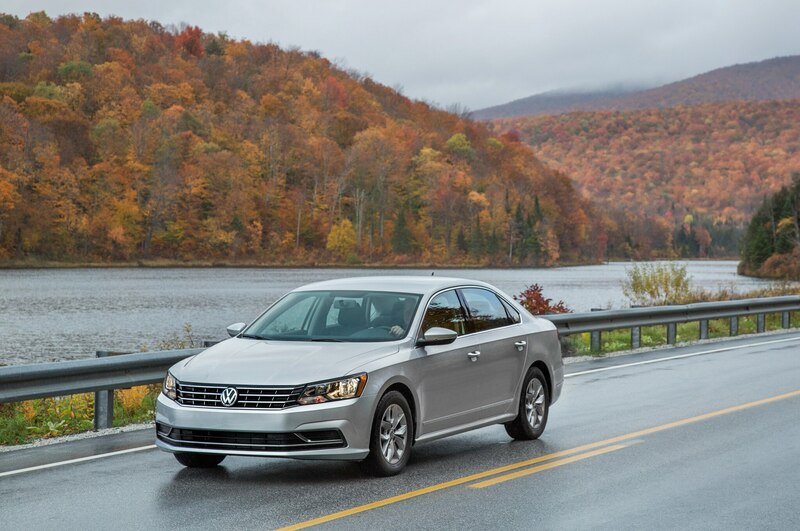 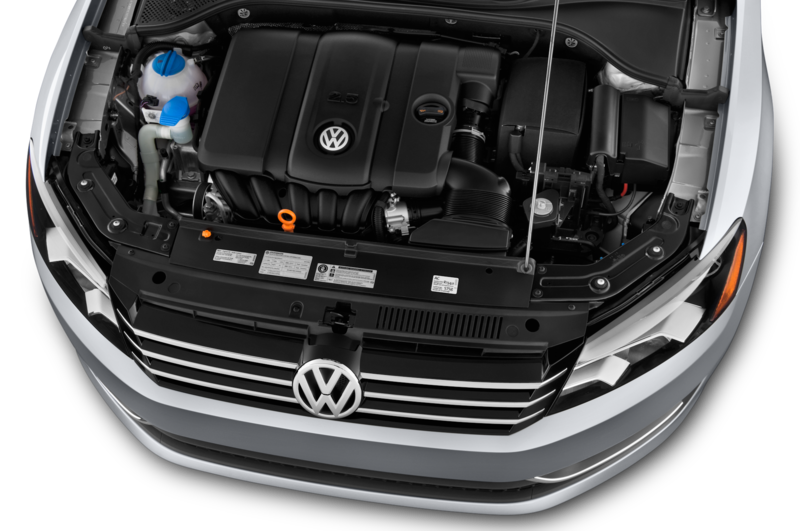 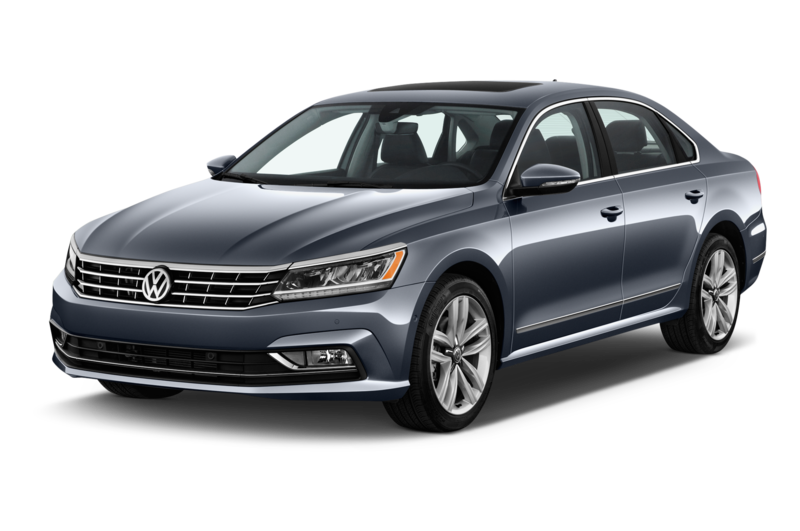 All versions of the 2016 Volkswagen Passat, save the $37,655 V6 SEL Premium, come with the same 1.8-liter turbocharged four-cylinder engine and six-speed automatic transmission. 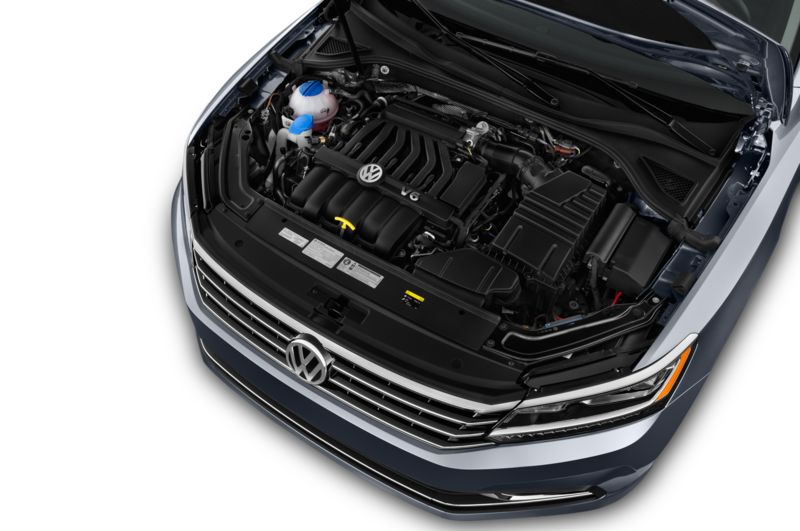 The turbo-four puts out 170 hp and 184 lb-ft of torque, and the six-speed torque-converter automatic keeps the potent little engine on the boil. 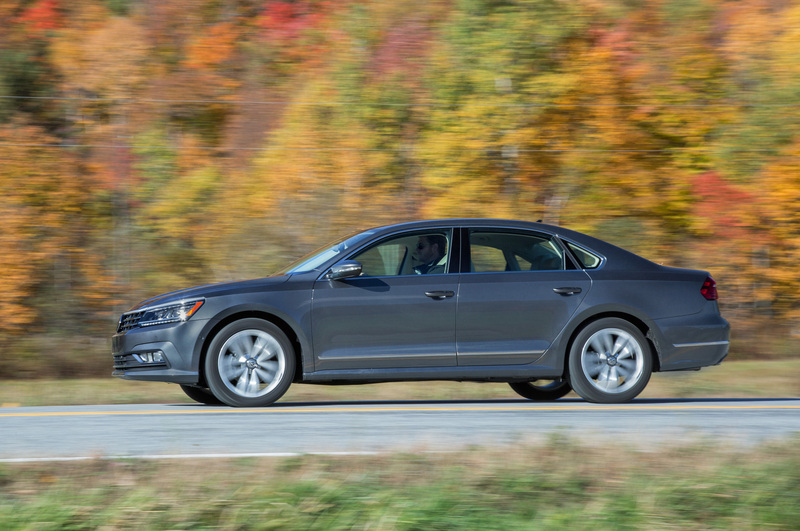 The four-cylinder is surprisingly refined and quiet, even at high rpm, and EPA fuel-economy ratings rise 1 mpg in the city and 2 mpg on the highway. 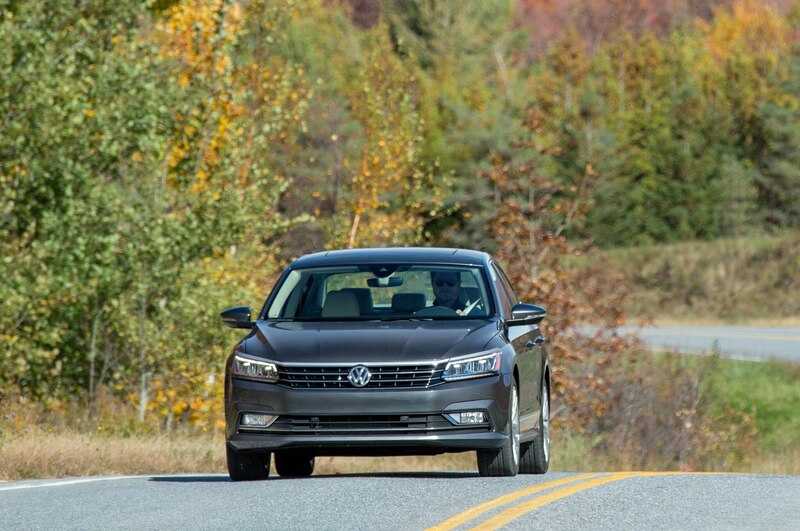 While the 280-hp V-6 is noticeably more powerful and shifts smoother thanks to its a dual-clutch automatic transmission, there’s little reason to spend almost $38,000 on a fully loaded Passat when you can spend that kind of money on a well-equipped Acura TLX, Buick Regal GS with all-wheel drive, or even a base Lexus ES. 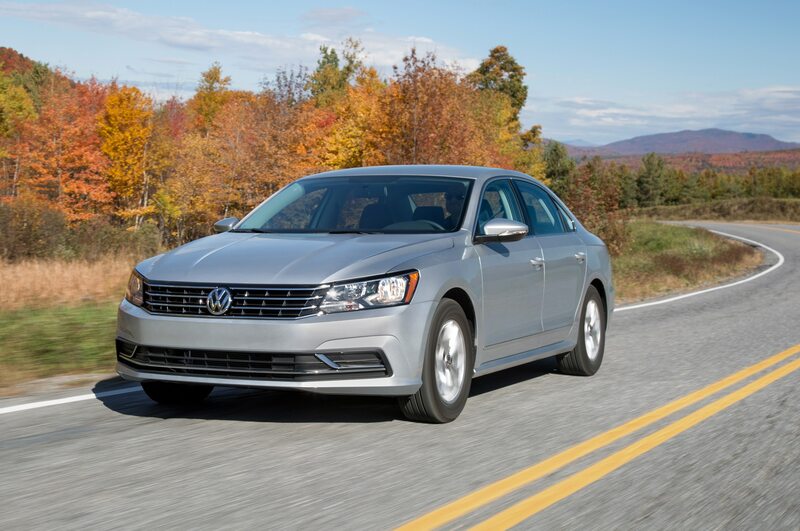 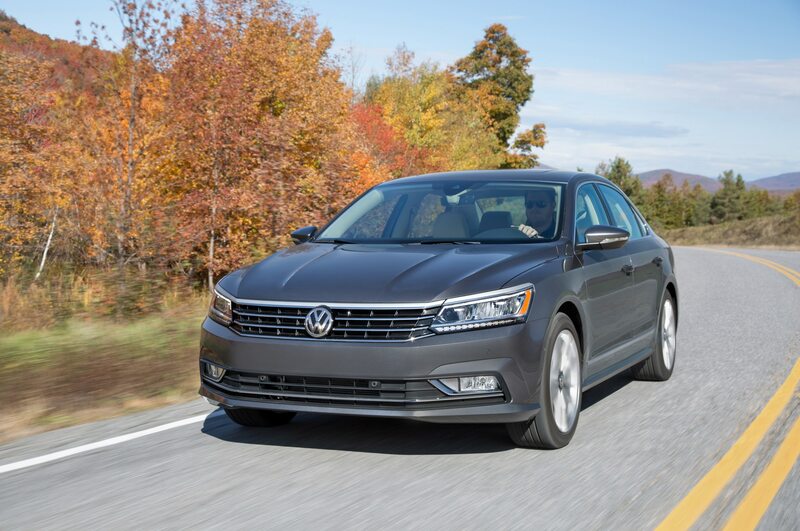 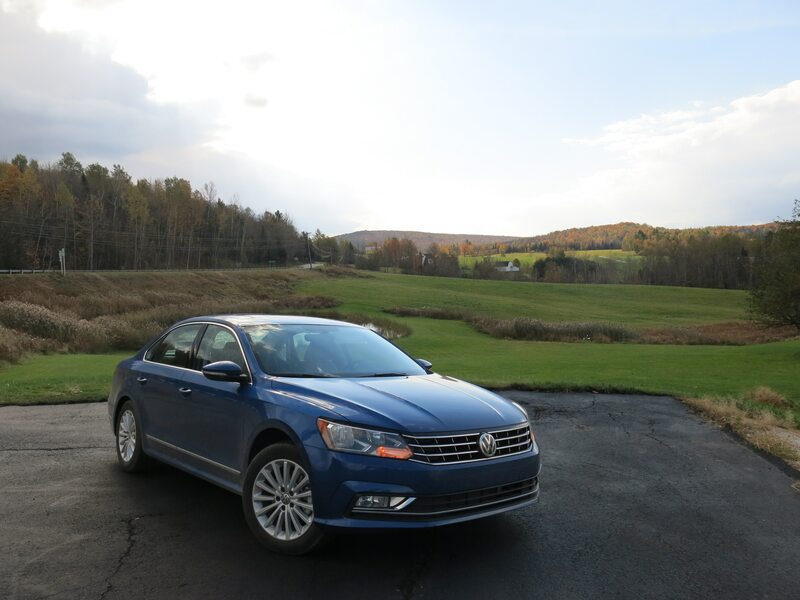 The fact that prices remain essentially unchanged makes the Passat even more appealing in its hypercompetitive segment, although the absence of TDI models, which accounted for about 25 percent of Passat sales and gave the car a unique selling point in the marketplace, will no doubt hurt sales. 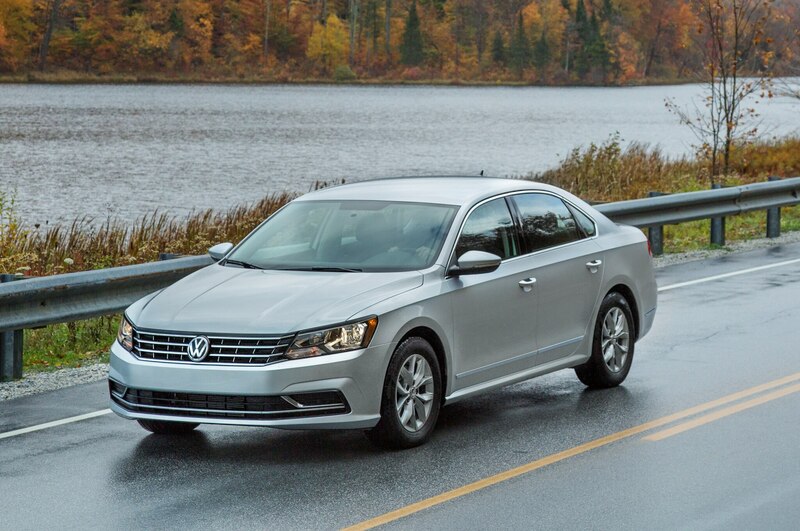 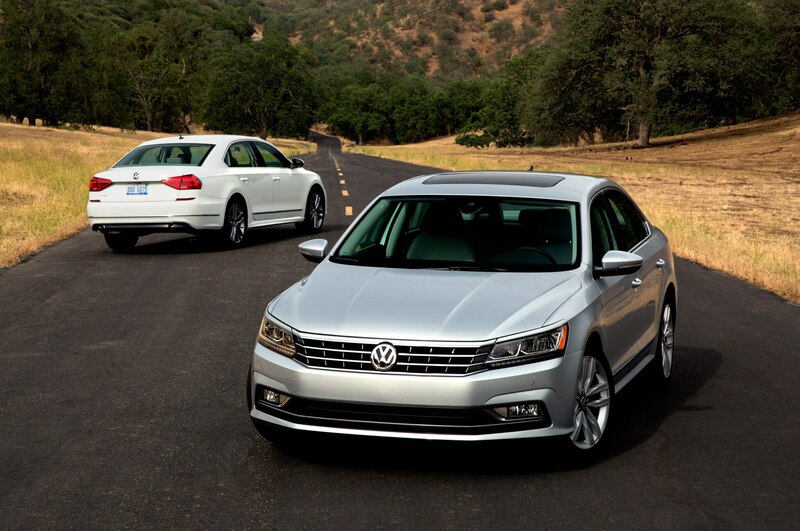 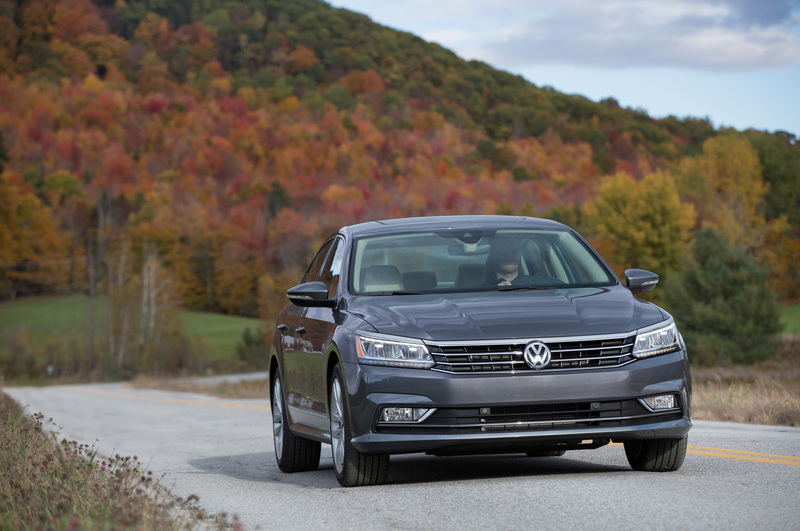 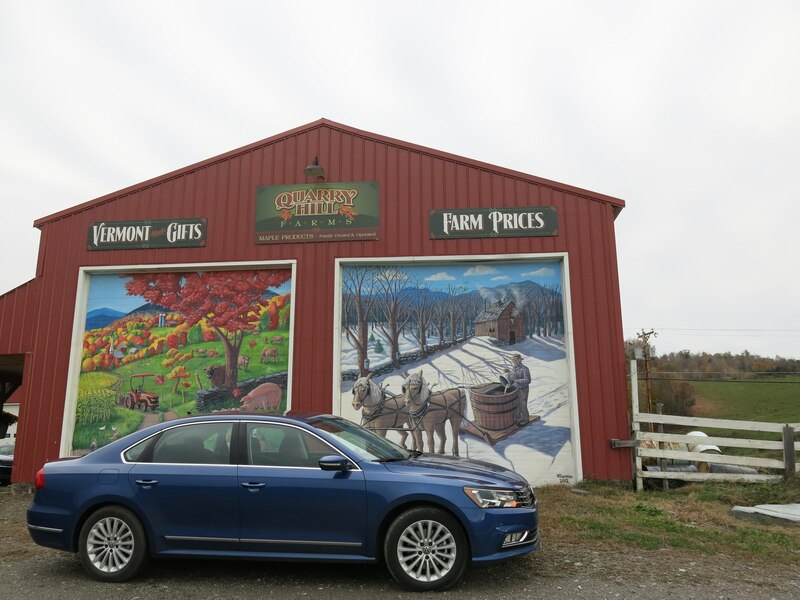 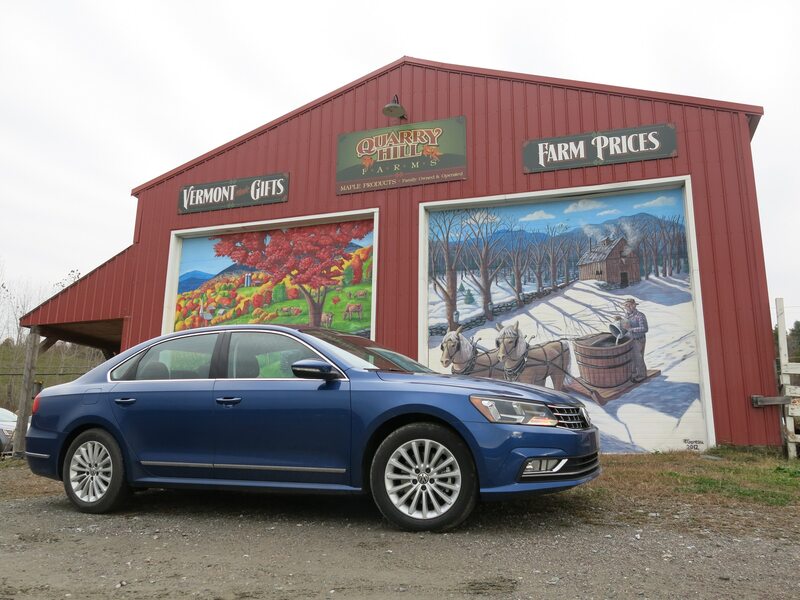 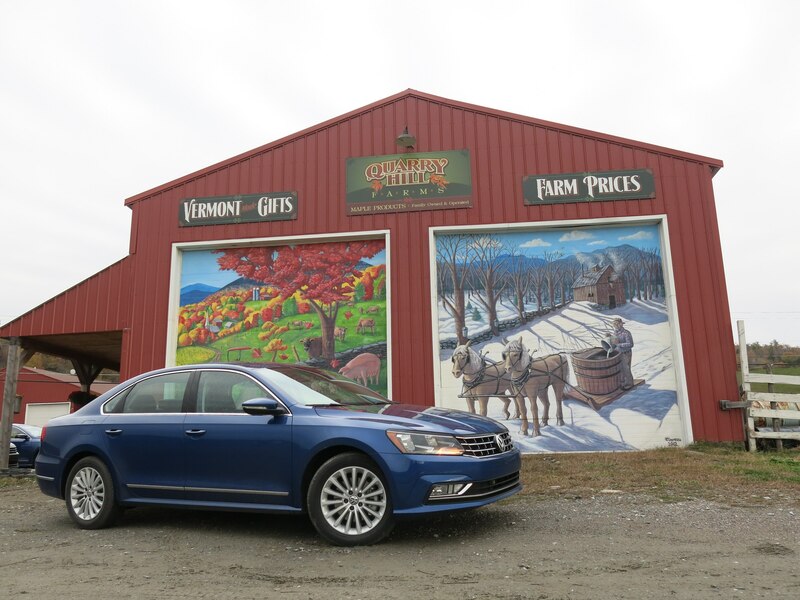 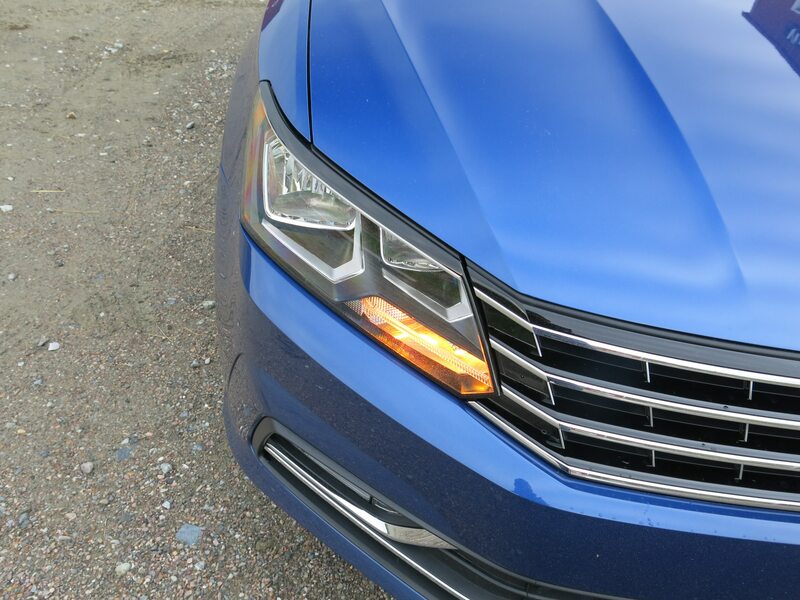 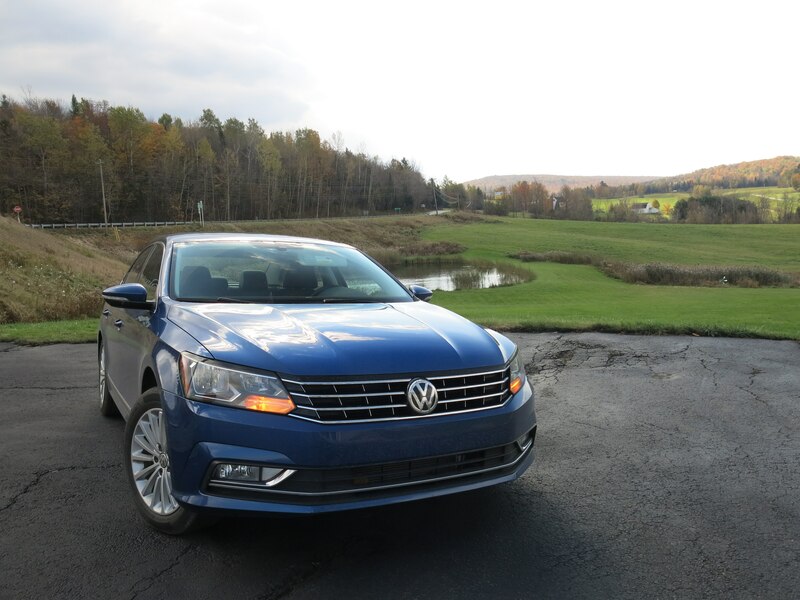 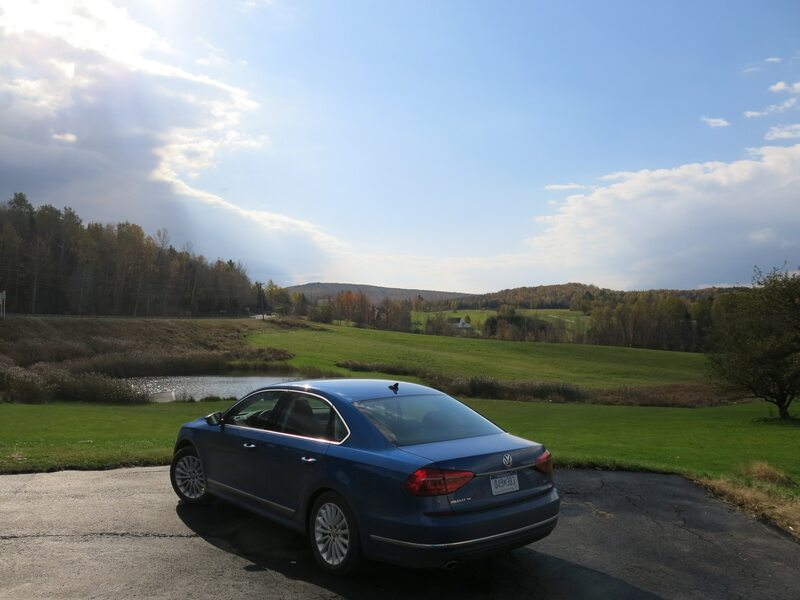 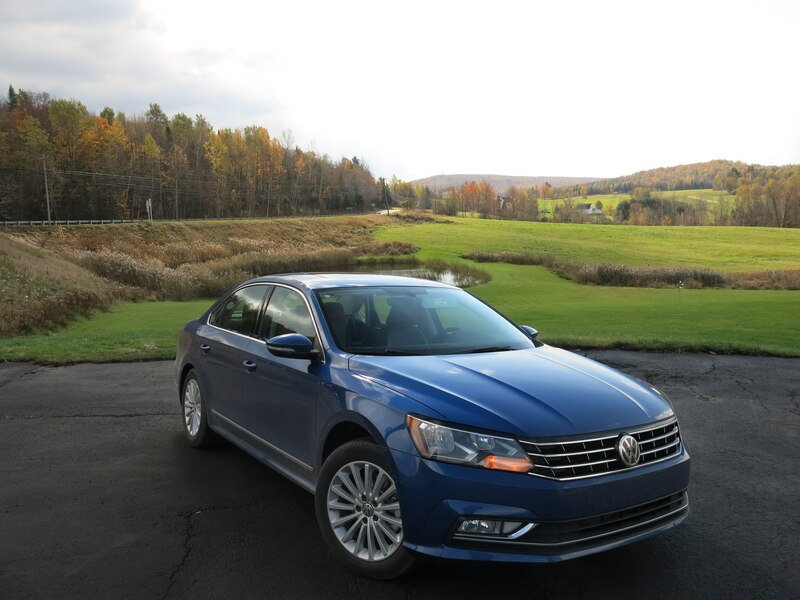 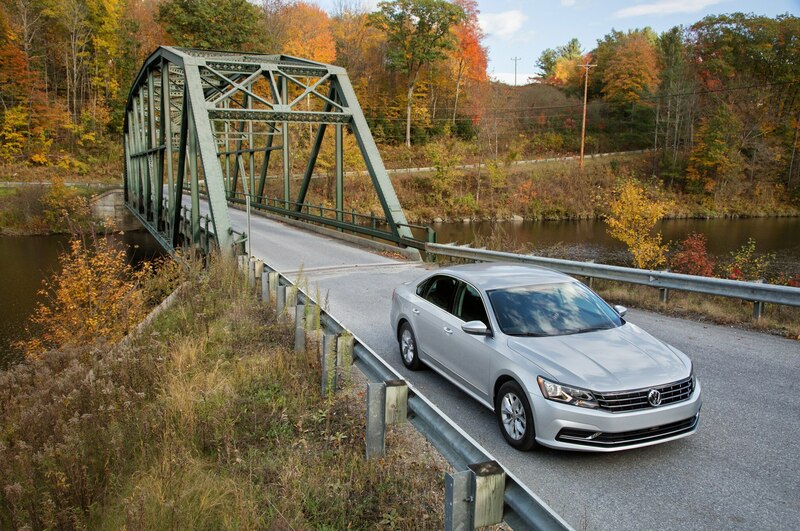 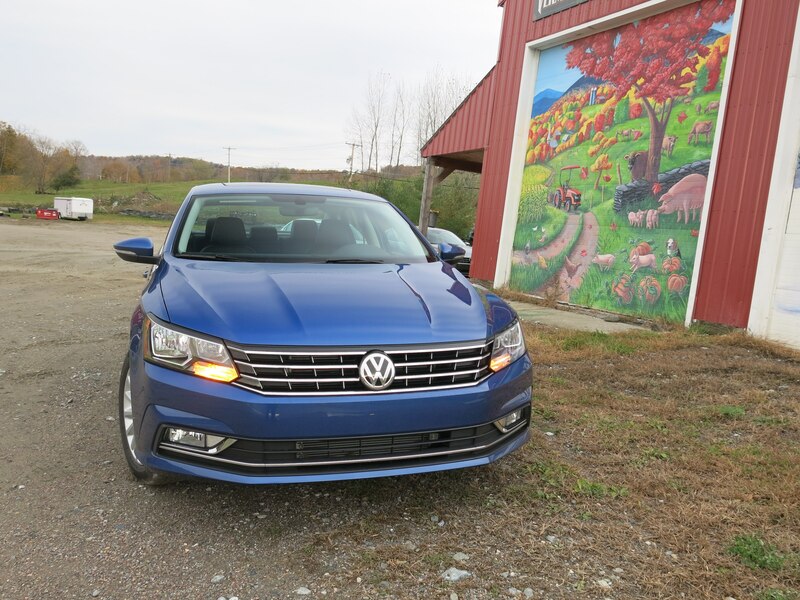 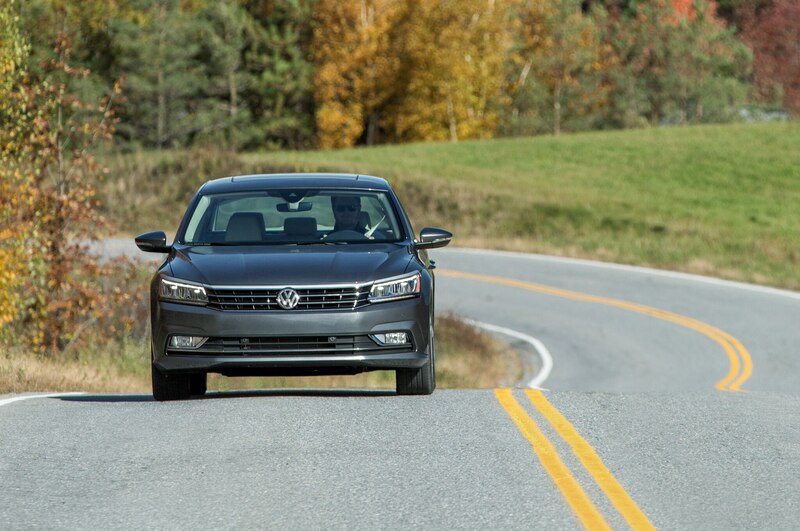 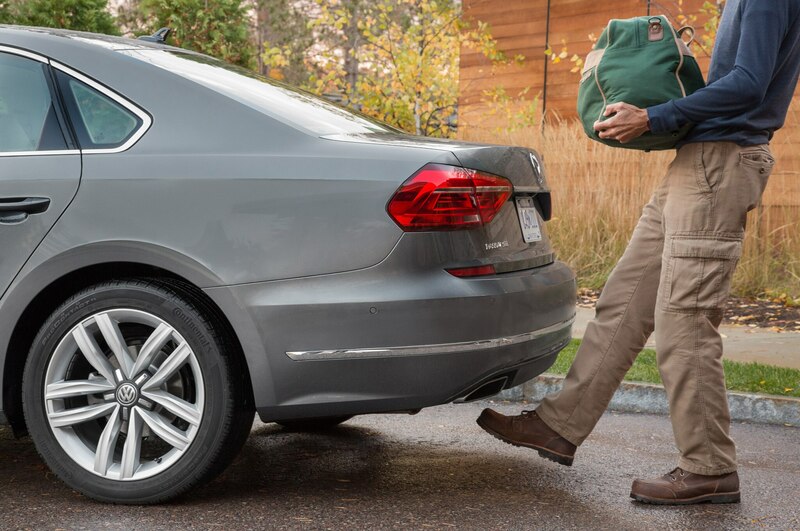 We’ll see how well the refreshed 2016 Volkswagen Passat can weather the storm its creator churned up. 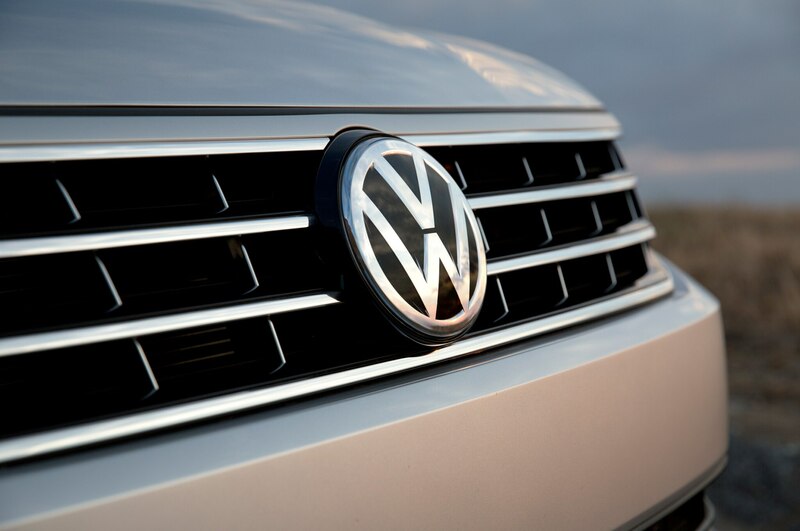 Top ranking has more stringent requirements this year.